In the following descriptions of track and field sports it has been assumed that the reader is more or less familiar with the subjects treated, and cognizant of the minor technicalities of athletic work and phraseology. These papers are not intended to convey information to the layman of sport, but rather to aid and instruct the young athlete who is so situated that he cannot secure the personal training and instruction available to those who live in large cities, or who attend schools and colleges where physical instruction forms part of the regular work. A majority of the illustrations are direct reproductions from photographs taken of the best and most experienced exponents of each special event, and the accompanying text has in most cases been revised by the athletes represented. In this way there is offered to the reader the clearest possible explanation and description that can be obtained of the standard athletic events, and every one who follows the directions and suggestions offered may feel confident that he is working along the right track, and that when he eventually secures the assistance of a trainer he will not find it necessary to start again at the beginning and unlearn all that he has hitherto looked upon as the correct method. Because of the widespread interest in the bicycle, it has seemed advisable to add a chapter on bicycling for men and one on bicycling for women, and a few hints and suggestions on the care of the wheel. The extracts from the A. 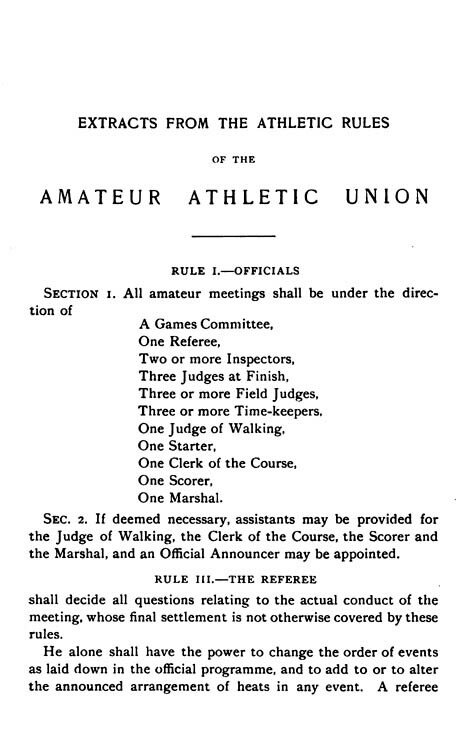 A. U. rules are used by courtesy of Messrs. A. G. Spalding & Bros., and are taken from the official hand-book of the Amateur Athletic Union. Of all track-athletic events the sprints are the hardest to train for, yet the easiest to perform. Being the easiest, there are consequently many more athletes running the 100 and the 220 than there are competing in any other single events; but among all these competitors there are comparatively few really first-class men. To become such requires long and patient and careful training, and a greater mastery of form than in almost anything else. It is a difficult task to tell on paper just what a man should do who wishes to make a specialty of sprinting. There are so many small points of importance that vary with individuals, that only a general description and a few broad suggestions can be given here. At the same time, whoever accepts these suggestions and heeds them may feel confident that he is working along the right lines, and that if he will follow the advice here set down he will put himself into condition to make rapid strides of progress as soon as he comes under the management of a trainer. No one ought to begin to train for any athletic event much under the age of sixteen. Until that time few boys are sufficiently developed physically to be able to stand the strain of regular athletic work. At that age and afterward, however, the muscles become firm, and are amenable to development and capable of continuous careful exercise. You will hear a great deal of talk about “wind” and “breathing” and “lungs,” and kindred subjects, when you first begin to train as a runner. Pay no attention to these “wind” advisers. Your wind and lungs will take care of themselves. In the first place, the lungs are not at all the organs that you want to think of in this connection; it is the heart. The heart is the organ that is affected by running. Run a hundred yards, and you will find your heart beating faster than when you started. The exertion of sending the blood more rapidly through the body is the cause of this. Therefore a sprinter should first feel confident that he has a strong heart; he may then set to work with no misgivings about his wind. It is not the lungs that are affected by cigarette smoking. It is the heart. Take any smoker, and you will find that his heart beats to a different measure from that of an abstainer. For this reason sprinters should avoid tobacco. Another old-fashioned and exploded theory is that the athlete should run with his mouth shut. That is not necessary at all. In fact, sprinters are taught nowadays to run with their mouths open, and every first-class man in the event does so. It must be plain to every one that a man can get more air into his lungs, and thus facilitate the working of the heart, by inhaling through his mouth than through his nostrils. Of late all the best long-distance runners have adopted this breathing method, and find it the best. The training for the 100 yards and that for the 220 are almost identical, for an athlete who runs one of these events almost invariably becomes proficient in the other. In fact, the 220 is a long sprint—the word sprint meaning to run at full speed the entire distance of a race. The most important feature of sprinting, of course, is the start, and no runner can become too proficient in this. Up to within five or six years the standing start was universal, but in 1889 or 1890 Lee, of the New York Athletic Club, introduced the crouching start, and since then that has become the standard in America. In England some of the professionals used it, but not until the London Athletic Club men came over here in 1895 did British amateurs recognize the value of the crouch and adopt it. But they did adopt it after the international games, and no doubt the crouching start will soon become general among English amateurs. The position for the start is somewhat difficult to acquire and master, but once this is accomplished an athlete is certain to knock off one-fifth of a second from his best previous record. The first thing of importance is to fall into an easy position, with the hands on the scratch-line and the starting foot from 6 to 9 inches back. The other foot should be from 2 feet 6 inches to 2 feet 9 inches farther back. The runner should be raised up on his toes in an easy, springy attitude. Illustration No. 1, on the opposite page, shows exactly how that position is taken. Many runners lean on their knuckles, but a better way is to have the hands open, and to rest on the extended fingers. This gives more spring. In order to do this, and to keep hold of the running corks, fasten a rubber band at each end of these, and slip this over the back of the hand. When the starter gives the word to “set,” the runner should lean forward as far as he can without losing his balance, his head lifted so that he can get a full and clear view of the track ahead of him. When the pistol sounds he shoots ahead with all the force of both legs, but his first two strides are taken in a crouching position. Do not attempt to stand erect at the very start. Let the head and shoulders rise along a slanting line to their proper altitude, or there will be an infinitesimal but still noticeable loss of time. 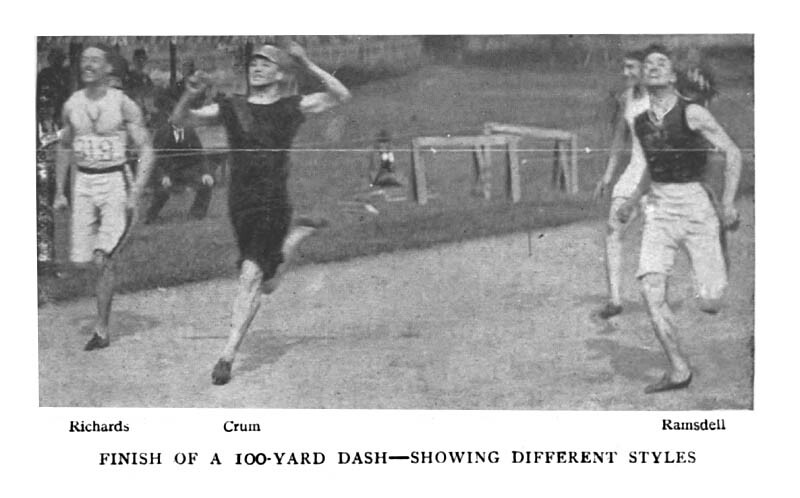 As soon as the runner has got into an erect position, however, and into his pace, he should run with only the very slightest forward inclination of the body, but with the chin, thrust well out. Illustration No. 2, on page 7, shows this well. The arms should be swung across the body rather than alongside of it. This gives better form and makes an easier stride. Never look backward while running. Many a race has been lost by that very act. Pay no attention at all to the other competitors, but go it for all you are worth, regardless of your rivals. Breathe naturally. Do not begin to stop until you have passed the finish-line, but, this done, throw up your hands and try to run up into the air. Illustration No. 3 demonstrates that idea. The man who naturally has a long stride has an advantage over his fellows, but the man who has not a long stride need not attempt to increase his spread of leg. An athlete can run much better with his natural stride than with an adopted gait. Of course, when jogging for practice, it is best to lift the legs as well up as possible, and thus develop whatever capabilities for a long stride you may have, but do not strain yourself by trying to overdo the thing. The foot should always come down straight upon the ground—that is, flat. This does not mean that the heel should touch, for it must not by any means. Yet a man does not run on his toes; he runs on the ball of his foot; and, in order that the spikes of his shoes may enter the track to the best advantage, the sole should strike flat, that the nails may dig well in and secure a firm hold. Monday.—Practise the start six times, running at speed only about 20 yards from the scratch. Rest between each attempt, and end up by jogging 50 yards, finishing up the 100 at speed. Tuesday.—Jog a quarter of a mile, for the purpose of developing the stride. Wednesday.—Run 75 yards at speed; rest, and then run 50 yards at speed. Thursday.—Practise the start ten times, running, as before, not farther than 20 yards each time; jog 220 yards slowly for stride. Friday.—Run 50 yards at speed twice, with a rest between. Saturday.—Run a trial 100 yards on time, and, after a rest, jog around the track for 220 yards. To an ambitious young athlete who feels he is a future record-holder this schedule may seem altogether too light. There are no words strong enough, however, with which I can urge him not to attempt to do a bit more at the beginning. What is more, at the slightest sign of fatigue at this work quit for the day. For practising starts, where a pistol is unavailable, get some one to snap two boards together. Don’t start by oral command. Get in the habit of getting off the mark at the crack of a pistol, or to a sound as nearly like it as possible. The jogging around the track should be taken very slowly, and is intended purely as a leg exercise and to develop the muscles of the calves and thighs. A long, loose jog will lengthen the stride. When preparing for a contest, lay off altogether the day immediately preceding it, and don’t run your distance against time for three or four days previously. Run only 50 yards at those times if you are going into the 100, and try 150 if you intend entering the 220. In a 220 race you will find that you can make a stronger finish if you ease up a trifle for five or ten yards at the 200-yard mark—although this is merely comparatively speaking, for this race is a dash from start to finish. It will be better not to experiment with this suggestion until you have become a pretty good judge of pace. The proper costume for a runner is a light jersey shirt with no sleeves, and china-silk running-trousers that barely reach to the knees. If china-silk is unavailable, cambric or cotton will do very well. Corks may be purchased of any dealer in sporting goods. Working shoes should be made of horse-hide, with no heels, and six spikes in the toes. The athlete should also have a pair of calfskin shoes of the lightest possible make for use in competition only. While at work it is well to wear light socks, as these make the shoe fit more snugly; but in a race wear “pushers”; these are made of chamois, and cover the toes from the instep downward. 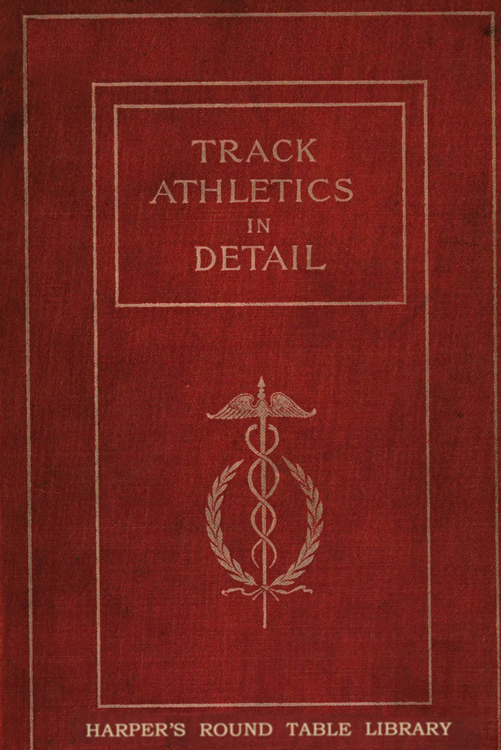 The middle distances are the hardest events for an athlete to work at without the assistance of a trainer; but this fact should not discourage the beginner, because there is a vast amount of preliminary work that he can do which will put him into such condition that when he does at last come under the care of a coach he will be able to make rapid progress towards proficiency. The term “middle distances” is usually applied to the quarter and half mile races only, for these have become recognized as the standards by amateur associations and clubs. The quarter-mile is sometimes set down on the card as a 440-yard dash—for it is practically a dash from start to finish, as run nowadays—and the half-mile is frequently called the 880-yard run. It is becoming more usual, however, to look upon these events as fractions of a mile. The preparatory work for the quarter should begin at the close of winter with walks of from two to three miles across country, ending up with a half-mile jog and a good rub-down. This sort of exercise should be taken every day for three weeks, in order to harden the muscles and get the body into regular habits of physical exercise. Let us presume that at the end of this time the weather has moderated sufficiently to permit of outdoor work in light running costume. This should consist of running at an easy gait distances longer and shorter than a quarter-mile on alternate days. For instance, on Monday, run 220 and 300 yards a couple of times, with a rest in between; on Tuesday run 600 yards or half a mile; on Wednesday run the short distances again; and keep on doing this for a month or more. Occasionally—say once a week—try 100 yards for speed, and about every tenth day take a trial quarter on time. The most important of all things in running the middle distances is that the athlete should become a judge of pace. He must know just how fast he is going. It takes time, of course, to acquire this knowledge, but the good men in the events know just how rapidly they are travelling around the track, and can tell to a fifth of a second what their gait has been for any fraction of the course. That is why these events are the hardest to run. The best way to acquire this knowledge of gait is to get some one to hold a watch on you every time you run. When you have not a trainer, however, this is not always possible. But there is no reason why you should not hold the watch yourself. And it is well to keep a record of your speed as it increases. Frequent runs of 150 and 300 yards on time will serve to show how your speed is getting along, and, the distances being short, this will enable you to judge of pace so that you can tell very closely how you are travelling over the various portions of your distance. As has been said, the quarter as now run is a sprint from start to finish, and the best thing to do in competition is to jump into the lead at once and head the field all the way, if you can. As in the 100 and 220, no heed should be given to the other competitors; and, above all things, never look back. There is little more to be said in the way of instruction for this event, for it is one that must be worked over according to the powers and capabilities of each individual. The general training after the first four or five months is about the same as for the sprints. As for the start, it is optional with the individual whether he shall stand or crouch. 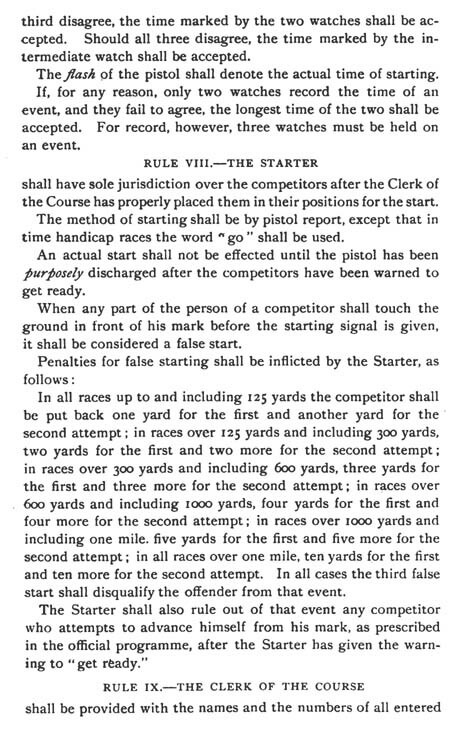 Burke, the world’s champion quarter-miler, who is represented in the series of illustrations on the opposite page, uses the standing start, but many others get off from the crouching position. 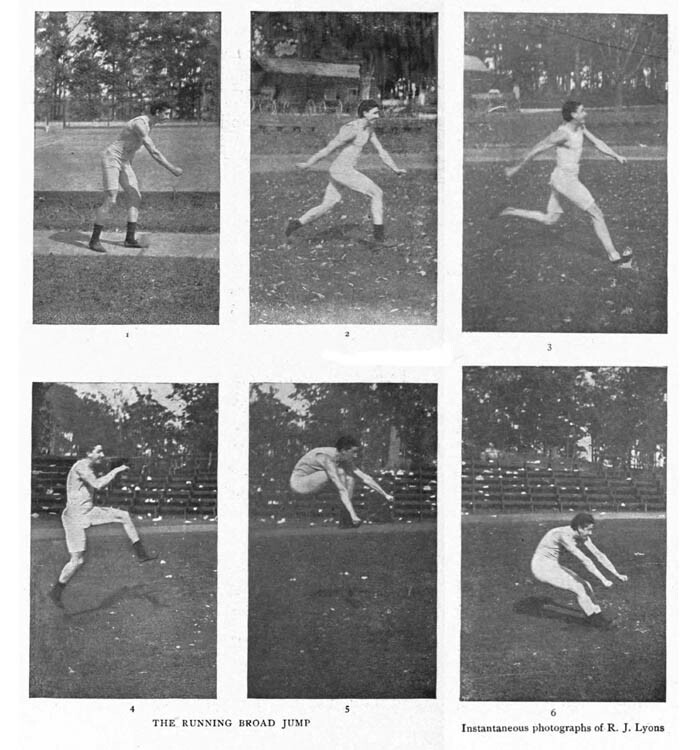 The second picture of the series gives a good idea of the pace and the general position of the body, both of which are identical with sprinting form. The finish is somewhat different. There is always plenty of space ahead after a quarter-mile race (which, of course, has to be run on a curved track) for the runner to keep on going as long as he wishes to, and thus he can pass the tape at top speed and keep on as far as he likes. Many hundred-yard sprinters, coming down a short, straight track, lose a fraction of a second of their speed by slowing up too soon. 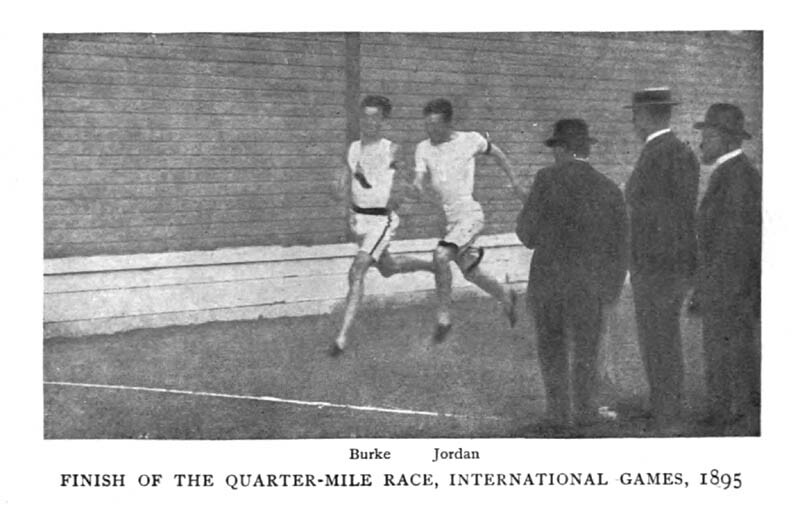 The half-mile run requires even a greater judgment of gait than does the quarter, and it is a much harder race to run, having now been developed into such a speedy contest that a man should never attempt to enter any other event in games where he runs a half-mile. Moreover, the athlete who adopts the half-mile as his specialty should give up every other event and train continuously and solely for that distance. He must get himself into such shape that he can tell, to a fraction of a second, just how fast he is going. This is learned only by having a watch going all the time, and while training there ought to be some one on the track to shout the time every furlong or so. The preparatory work for this distance is similar to that of the quarter—that is, there should be long and short work, over and under the distance, on alternate days. A half-mile trial on time once in two weeks is sufficient. The start and gait are the same as for the quarter. 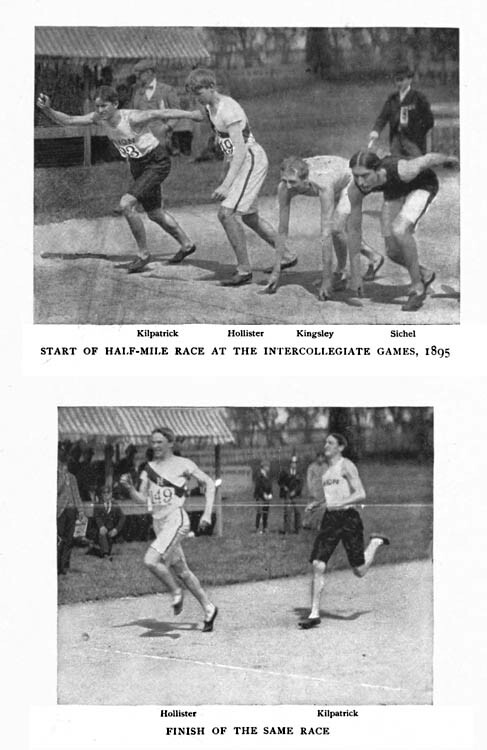 In the illustration of the start of the half-mile race at the Intercollegiates of 1895, opposite, it is plain to see that Kilpatrick is determined to get the pole if he can, while Sichel and Kingsley, who have inside positions, are determined to keep them, even if they have to take a sprinting start. Hollister, on the other hand, has apparently made up his mind to let Kilpatrick set the pace, and then try to pass him. This was wise of Hollister, because he knew Kilpatrick’s habit was to run a very fast first quarter, and he himself had been trained to sprint hard at the finish. Thus he felt that if he could keep up with Kilpatrick for the first three-eighths he could sprint past him at the finish. Hollister is shown winning in the second illustration on page 19. I give this illustration of the tactics of half-mile racing to show how much strategy has to be used in this event. You must know how your opponents run, and you must distribute your energies over the race so as to counteract as far as possible those of the other competitors. It would have been unwise for Hollister to fight with Kilpatrick for the lead in this case, because the latter could have run him off his feet. That is Kilpatrick’s style. But by letting Kilpatrick set the pace, Hollister had an easier time of it in the first quarter, because he did not have to give any thought whatever to his gait. When it came to the stretch, all he had to do was to sprint. Nevertheless, the best general rule for a novice is to jump to the lead and hold it if he can. When he gets to be a first-class man he can devote more thought to the individual work of his opponents. One of the best things for any one working at the half-mile is to attend every meeting he can and watch the work of other half-milers. In fact, it is well for every athlete to follow big games, and study his own event in the work of others. Big championship games should never be missed if it is a possible thing to witness them. 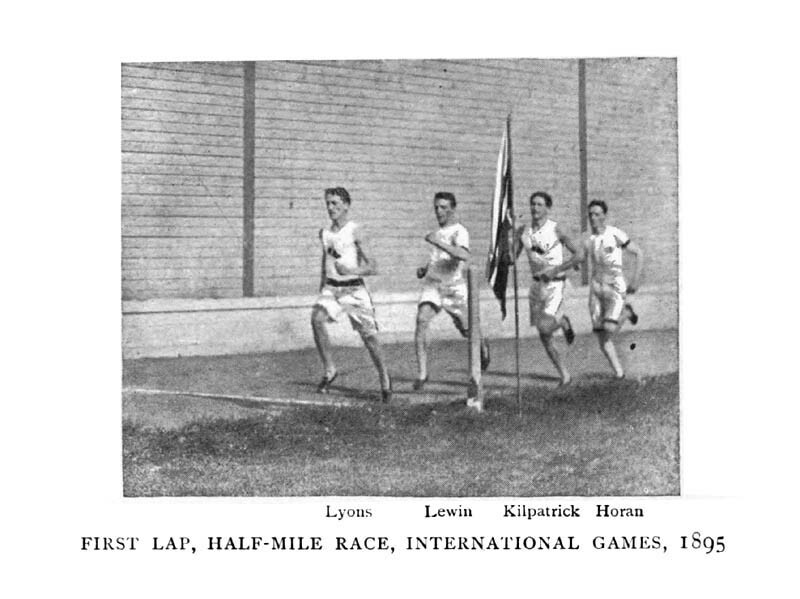 The mile run is about the only long-distance event practised by American school and college athletes. 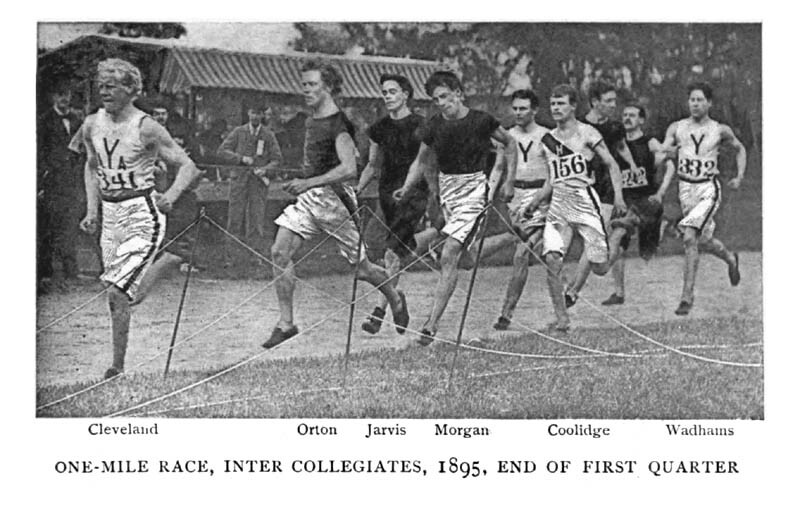 In England the three-mile race is popular, and is one of the standard events of the interuniversity field meetings, but it has not as yet been adopted in this country. 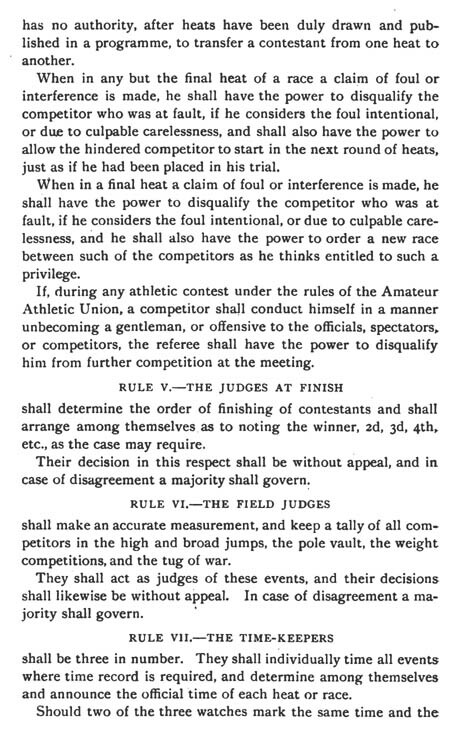 At the International games of 1895 it was on the card, and Conneff won for the New York Athletic Club. Since then there has been some talk of placing the event on the Intercollegiate schedule, but the proposition to do so was defeated. Training for the mile run may be begun at almost any time of the year, but it is presumed in all these short sketches that training will be started in the winter-time and developed in the spring. Preliminary work in long-distance running is of the simplest kind, consisting merely of walking and running at a slow jog four or five miles every day until the spring season has fairly set in. For this kind of work the best costume to wear are knickerbockers, heavy shoes and stockings, a flannel shirt, and a sweater. This walking and running across country will harden the muscles and gradually develop staying powers, which can be acquired in no other way. When the weather has become warm enough to permit track work in light running costume, the following scheme will be found a good one for steady training: On the first day do a mile and a half at an easy jog; on the second day, run a half-mile at a good pace, trying to do it in 2 min. 45 sec. (as the weeks pass by the athlete should try to reduce this time for the half-mile down to 2 min. 30 sec. or below); on the third day run a quarter of a mile at speed; on the fourth day cover three-quarters of a mile at an easy jog; on the fifth day do a mile and a half again very leisurely; on the sixth day another quarter at speed. Always lay off on Sunday, for one day’s rest a week is necessary when training for any event. After this method has been practised for several weeks, it will be well to take a trial mile on time. But thereafter do not run trials more frequently than once in ten days, and never make a trial within ten days of the date of a race. Before a competition it is well to lay off for two or three days, and before trying a mile on time during the practice season it is always best to lay off the day before. In other words, do your trial mile on Monday, Sunday being the regular lay-off day. There is little to be said about the strategy of mile-running. The mile-runner must know just how fast he can run, and when he goes into a race he should cover his distances regardless of what his rivals are doing. This is sometimes very difficult, especially for younger runners who are not judges of pace, and who allow themselves to be run off their feet in the first half-mile. It is true that the first half-mile is always run at a greater speed than the second; but a well-trained athlete, who knows exactly how fast he can do his event, should not allow any opponent to make him go faster than he is in training for. A number of athletes, knowing the average weakness of mile-runners, train themselves to go a very fast half-mile at first, in the hope that they may run their opponents, who have trained in a different way, off their feet. Those, however, who are confident of their ability, and are judges of pace, will frequently allow these fast fellows to get a quarter of a lap ahead of them, knowing very well that in the second half-mile they will be able to close up and finish strongly. 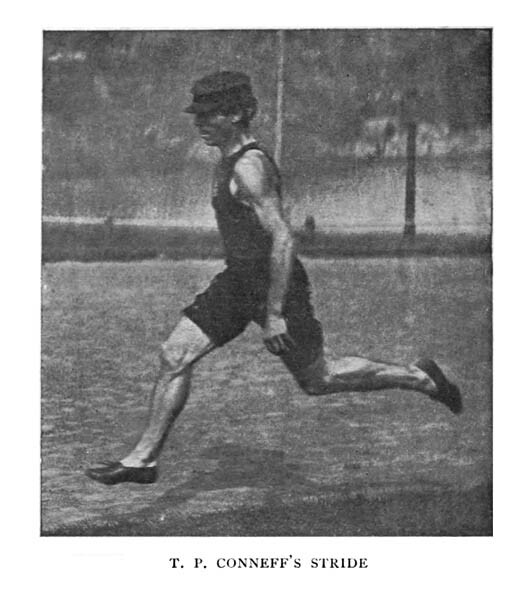 The pictures on pages 24 and 25 show the stride of Conneff—the American and International champion—and of Lutyens, the English Interuniversity champion, who was defeated by Conneff in the International games of 1895. 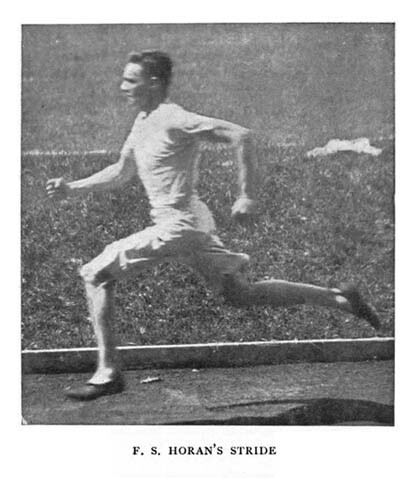 It is plain to see that the Englishman’s stride is much longer than Conneff’s; but stride does not seem to be such an important factor in long-distance running as it is in the shorter distances. In fact, it will be noticed that most mile-runners are short, stocky men, although, as a rule, their legs are much longer in proportion to their bodies than is the case with other men. Conneff runs with his mouth open the whole distance, and, as has already been stated, this is undoubtedly the best method for runners to adopt, in spite of the old adage about breathing through the nose. Conneff also runs with his arms hanging down, which is by far the best way, as it relieves the chest and shoulders of the weight of the arms (which counts in a long race), and the swinging of the hands low down seems to give a forward impetus similar to that which a jumper gets when he uses dumb-bells. 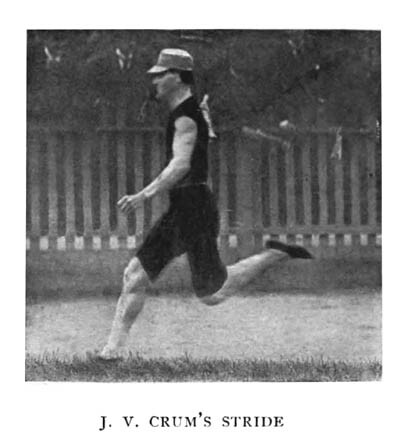 The costume and footwear for long-distance running are the same as for other distances, except, perhaps, that the shoes may be made a trifle heavier if the athlete prefers. 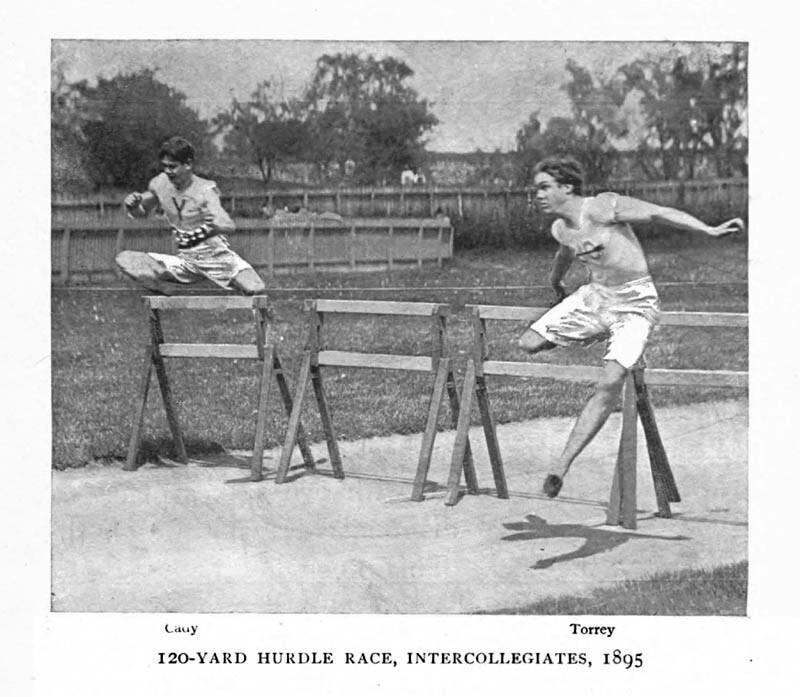 There are two distances for hurdle races which have become recognized by the Intercollegiate Associations and the larger athletic clubs as the standards for this event. The shorter distance is 120 yards, the race being run over ten hurdles, three feet six inches high, placed ten yards apart, the first and last obstacles being respectively fifteen yards from the starting and the finishing lines. The longer distance is 220 yards, the ten hurdles in this case being two feet six inches high, twenty yards apart, and the first and last respectively twenty yards distant from the start and finish. These two events are usually spoken of as the “high hurdles” and the “low hurdles,” the distances being invariably understood as given above. Hurdling requires skill, strength, spring, nerve, and a cool head; and to become a fast hurdler you must devote several years of hard and faithful practice in this particular event. The training for a beginner should be begun in the gymnasium in the winter, with light calisthenics, rising on the toes, rising on the heels, raising the legs, and practising the double jump on the toes. There is also a peculiar exercise, which consists of raising one leg, bent at the knee, forward, and the other leg, bent at the knee, backward, alternating the legs at each motion; this serves to limber and strengthen the muscles that are used in hurdling. An occasional short jog out of doors on fair days, and light all-round work in the gymnasium, for general physical development, should be made a part of this preliminary training. One of the best exercises that a hurdler can possibly indulge in is to dance up and down on the spring-board for ten or fifteen minutes every day. This develops that very necessary quality of spring and suppleness. When the out-door training season begins, the first two or three days should be spent in jogging up and down the track. After that take occasional sprints of thirty or forty yards, without practising the start. On the third day practise the start two or three times, and try clearing one high hurdle about three times. On the fourth day do the same thing. On the fifth day place two high hurdles on the track at their proper distances, and negotiate them two or three times. On the sixth day repeat this performance with three hurdles. After this first week of out-door practice, whenever the hurdles are being jumped, the athlete should rush at them with his utmost speed from the proper distances, so as to become accustomed to them. The general training for a hurdler should be about the same as that for the 100 and 220 yard dashes. After three weeks of this kind of preliminary work, the high hurdles may be placed in position, and the hurdler may try going over the whole distance on time; but he should never attempt this more than once or twice a week, doing his daily work over not more than three hurdles. There are two things of vital importance for the hurdler to work at in order to acquire speed: he should drive himself as fast as he can go from the crack of the pistol until he stops running, and each hurdle should be rushed at as if it were the last. Speed between the hurdles is of the utmost importance. The secret of obtaining this lies in starting the foot which has crossed last over the hurdle forward for the first step before the forward foot has reached the ground, thus making the first step after the jump a very short one, yet a very quick one. This is a difficult movement to learn, but the athlete will find that it will lower his time perceptibly if he can master it. The instinctive act upon landing after the leap is to take a long stride forward with a view to covering distance. But the athlete must restrain this inclination and force himself to take a short step, even if he has to work over it for months, or he will never be able to acquire skill or speed as a hurdler. That first short step after clearing the hurdle gives the runner his impetus, and the other two steps easily follow. The third step is shorter than the second in order that the runner may gather himself slightly for the spring over the next hurdle. The ideal distance between steps in a high-hurdle race is shown in Fig. 1. 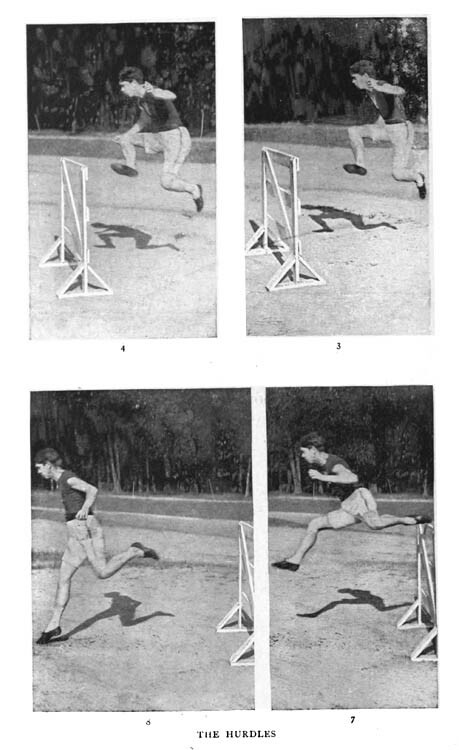 The runner alights about 7 feet 6 inches from the obstacle, and then takes the short, quick step already mentioned (4 feet 10 inches); then he makes a long step (5 feet 10 inches), and then another short step (4 feet 4 inches), which brings him within 7 feet 6 inches of his next hurdle, and he makes that spot his takeoff. 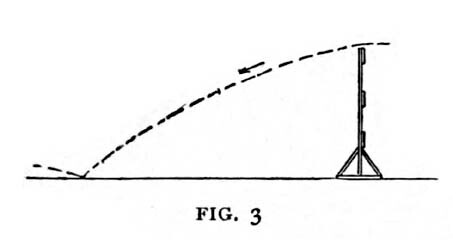 A fatal fault of many beginners is to bring the forward foot down in such a way as to cut off the length of the jump, as shown in Fig. 2. The first foot should be made to shoot as far forward as possible along an imaginary line, as shown in Fig. 3. As the last hurdle is cleared, the head should be thrust forward as the athlete lands on the ground, and so held, for this will greatly aid in the sprint for the tape. Training for the low hurdles is, in general, the same as that for the high hurdles. The jump over the obstacle itself, however, is radically different, and it is for this reason that many hurdlers who are invincible over the shorter distance are frequently defeated in the longer. In clearing the low hurdles the athlete should endeavor not to jump. He must put as little spring as possible into his effort, but should clear the obstacle by a dexterous management of the legs. Here is where one advantage of the double-jump exercise comes in. In the 220 race the body of the hurdler should be kept on as constant a level as possible. In other words, his shoulders should move along an imaginary straight line from start to finish. Fig. 4 shows this more clearly perhaps than any description can. The line AA is the one that the shoulders should follow; the line BB shows the motion that should be avoided. With practice this form can be readily acquired, and it adds greatly to the speed of the hurdler. The secret of the motion is to lunge slightly forward at the hurdle and to clear the obstacle by a dexterous movement of the legs. The movement is somewhat similar to that which a man would make if he were suspended from the ceiling, his toes just touching the floor, and a series of hurdles on a treadmill were passing under him. To avoid being struck he would merely lift his legs, as he has learned to do in the exercise described on page 29. The low hurdles being placed twenty yards apart, it is of course necessary to take a greater number of steps between obstacles. Seven strides is the number to be aimed at, although a runner with a short stride has to be content with nine. 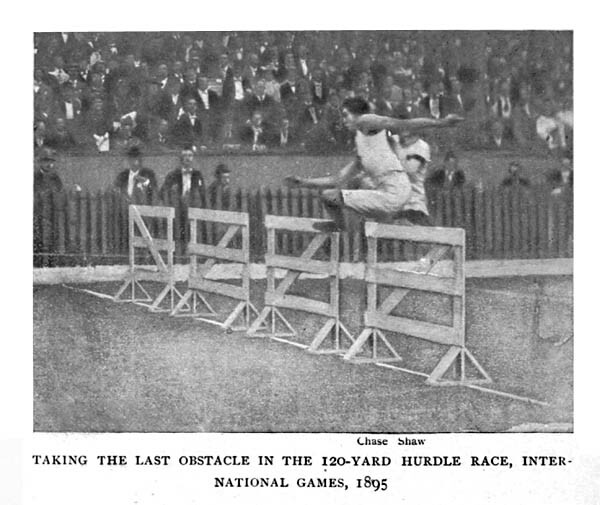 The latter sometimes necessitates slowing up before each hurdle, which is fatal; and consequently it is more advisable to train for eight strides, in that case jumping from alternate feet. This makes a race upon a curved track extremely difficult, and is a form that should be avoided, although there are many men who are compelled to adopt it. In practice the athlete should never go over more than seven hurdles in succession, except, perhaps, once in two weeks for a trial on time, because the event is too exhausting. The footwear adopted by hurdlers is similar to the high-jumper’s shoes. They are made of kangaroo-skin, and should be slightly heavier than sprinters’ shoes. The heel should be constructed of quarter-inch leather with two spikes placed at the extremities of diagonals drawn through the centre of the heel. This precludes the possibility of bruising from the constant pounding on the jumping foot. In the toes there should be the usual six spikes. The hurdles, whether the high or the low, should be cleared by as narrow a margin as possible. From the standpoint of speed it is better to strike the top bar lightly rather than to clear it by several inches, for this margin makes a loss of time. The illustrations on pages 29 and 30 give a very good idea of the position a man should train himself to assume when clearing the sticks. 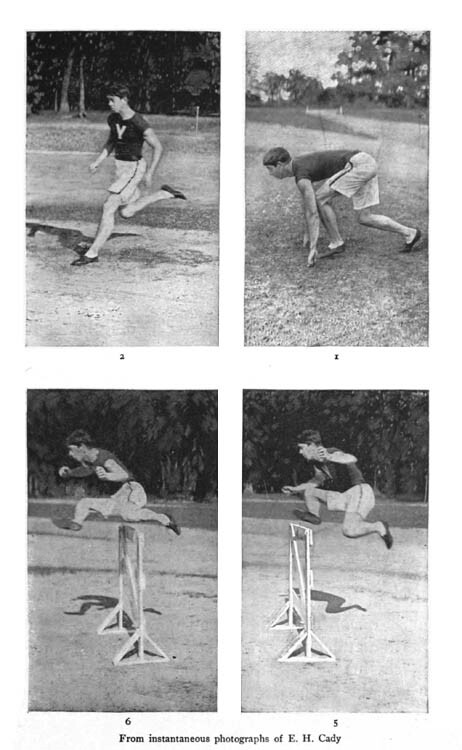 The eighth illustration gives a very good idea of the distance of the landing-spot from the hurdle, as shown also in Figs. 1 and 2. The single thing which probably requires the greatest practice is to get the exact length of stride for the various steps between hurdles. A good way to get this is to mark these spots on the ground, and then go over the hurdles, lighting on these spots, until the stride has become absolutely natural. But no cast-iron rule can be laid down for any one. By aiming at this ideal the hurdler will gradually work into a stride best adapted to himself. 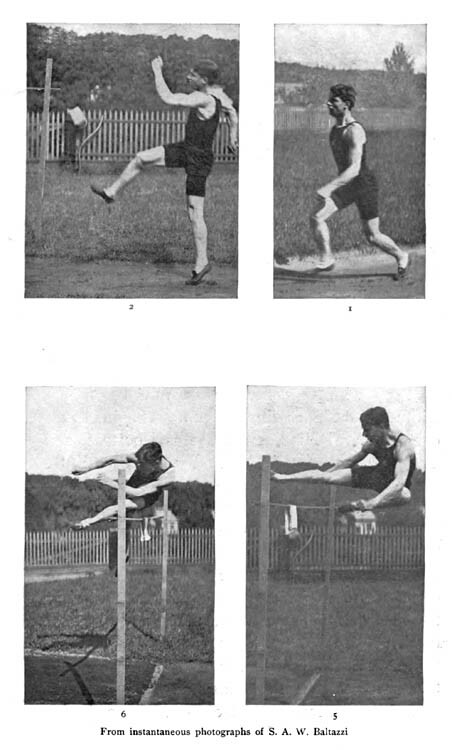 In running the high hurdles the athlete may use either foot he chooses at the take-off, although it is better to become accustomed to jump from the right foot. It is better, because in the low hurdles the successful man must jump from the right foot. This is made necessary by curved tracks. There are few 220 straightaway courses, most low-hurdle contests being conducted on a curved track; and it is practically impossible to make any speed at all on such a path when jumping from the left foot. J. P. Lee used to jump from the left and right foot alternately, and for that reason he scarcely ever entered a contest on a curved track. He knew he could not win. There is a difference of opinion among the best men in this event as to whether the standing start or the crouching start is the better. Those who take the upright start assert that they can get off quicker and are in better condition to take the first hurdle, which is only fifteen yards away, and say that it is difficult to rise to the proper jumping position in such a short run. Those who favor the crouching start deny this. This is a case where each individual must decide for himself which method he prefers. Another vital point that must be observed is to rush for the first hurdle with the utmost speed, for the way in which the first obstacle is reached and cleared often decides the race. It may be well to add that under no circumstances whatever should the hurdler look back over his shoulder to see the position of the other competitors. This fault has lost the leading man many a prize. A hurdle race is a constant drive from start to finish. This event is the least athletic of any on the intercollegiate or interscholastic schedules, and will doubtless be dispensed with entirely in a year or two. There are few exercises for the general run of men any better than walking—walking across country, at a natural gait, head up, chest out, toes turned out, and arms swinging easily at the sides. Such walking is natural and healthful. 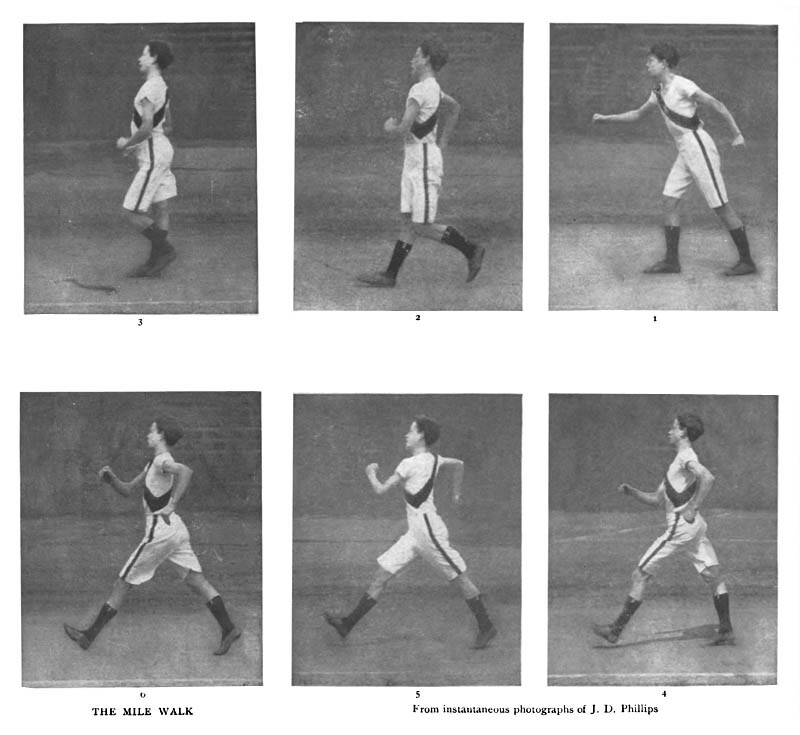 “Athletic” or “heel-and-toe” walking—exaggerated stride, heel pounding, toeing in, and all that—is artificial, and of no particular benefit. It is not harmful, of course, because it is exercise, and all normal exercise is beneficial. The muscles that require the greatest development for walking are the abdominal and the fore-thigh muscles. Training should be begun as soon as the snow is off the ground by taking walks across country. Begin, of course, by taking short walks, in order to inaugurate a general hardening process, and each day when you come to a good stretch of road, try two or three hundred yards of strict heel-and-toe walking, giving especial attention to the free and rolling motion of the hips. This motion is clearly shown in illustration No. 3 on this page. To become a successful walker it is absolutely necessary to be loose and supple about the hips. The novice will notice pains about the abdomen at first, but he need not feel in any way alarmed. He has not caught cold. He has merely set some muscles to work that are not usually called upon to exert themselves under ordinary circumstances, and for a week or two they will feel sore and lame. After a week of general unlimbering the walks should be extended, and distances between five and ten miles should be covered. In all this walking the athlete must train himself to set his foot down straight, for walkers may not toe out. At the end of two or three weeks, begin the alternate work as told of in the foregoing chapters for running events. That is, one day take a ten-mile walk at an easy gait, and the next a three-mile walk as fast as you can travel, and keep this up until you are ready to go on the track. But always rest on Sunday. One day’s rest out of seven is imperative. When work on the track begins, form is the principal thing to devote your attention to. Take long, slow walks around the cinder-path, putting the feet down straight and firmly, and devote all your energy to acquiring an easy stride, and, as far as possible, a long, swinging one. Work at the hip motion until you are master of it, and train yourself in the swinging of the arms until these become a means of assistance rather than an annoyance. The only way to acquire speed in walking is to “sprint” (not a running sprint, but a walking sprint) from 100 to 200 yards. Here again alternate work should be done—that is, walk a half or three-quarters of a mile, and rest, then walk half a mile, one day; and on the alternate days do short sprints several times, with rests in between. Don’t try to go a mile at speed until you have been at work several months. After the first couple of weeks it may be well to take a trial half or quarter on time, but this should never be done oftener than once in a week or ten days. When you have gotten into condition at the end of four or five months, try a mile on time, but thereafter never attempt to go the full distance at speed more frequently than once in ten days or two weeks. The costume for walking is the same as for running, except that the shoes have no spikes. The heels, too, are somewhat different, being built with a slight projection of the sole at the back, so as to make the constant pounding on the heel less severe. It seems almost needless to say here that walking differs from running in that one of the athlete’s feet must be constantly on the ground, he must not lift the rear toe until the forward heel has struck, and the rear knee must lock. The illustrations show the rear knee locked in every instance. By speaking of the knee as “locked” is meant that the joint is closed. In a race it is always well to take the lead, if possible, and walk your own mile. Before going into a contest the athlete ought to know pretty well how fast he can cover his distances, and he should disregard his competitors as much as circumstances will allow. Walking has fallen somewhat into disrepute of late, because unscrupulous athletes, proficient in the heel-and-toe method, can frequently run without apparently altering their form, and when the Judge of Walking is not at their very heels they travel rapidly, but unfairly, over the course. But this is not sport. It may well be set down as an absolute rule that no one should attempt to start in to train seriously for the running high jump until after he is eleven or twelve years old. In fact, it is safe to say that no one under that age should ever go into any kind of systematic athletic work, for ambition is liable to lead the aspiring athlete into injurious over-exertion. If you want to take up high jumping as a specialty, spend the winter, or the indoor season, in pulling weights, so as to strengthen the back and chest, and in going through leg motions to fortify the limbs. No one can ever succeed as a high jumper unless he has a well-developed chest and back, for the strain on the dorsal muscles is practically what lifts the man over the bar. This sounds very much like lifting one’s self up by the boot-straps, but it is nevertheless correct. The leg exercises are simple. There are two kinds. One is to lift yourself up on your toes. Start in by doing it about twenty-five times every day for a week; then increase the number until you get up to about three hundred times. An expert high jumper can lift himself five hundred times without much fatigue. A second exercise is the “frog motion.” This consists of placing the heels close together and of squatting and rising. Do this a few times only to start with, and gradually bring yourself up to the hundreds. Exercise the chest with weights and dumb-bells. Strengthen the back by bending over with the legs stiff, the arms thrown out in front until the finger-tips touch the floor easily. Do not attempt any high jumping in the winter months when learning, for running on a hard board floor is not a good thing, as one is liable to slip and get injured. One week of practice in the open air is worth a month of indoor work. For out-of-door practice the jumper should have two square posts about two inches thick, made of almost any kind of wood, and bored with holes one inch apart up to 5 ft. 8 in., and half an inch apart above that. The pegs should be three inches long, and the bar, made of pine, should be about twelve feet long and one inch square. The posts are placed eight feet apart, and it is usual to hang a handkerchief over the centre of the cross-bar so that the latter may be seen better. A jumper must always keep his eye on the bar from the time he starts to run until he lands safely on the other side of it. The runway should be eight feet wide and about forty feet long. It should be made of cinders, well rolled, and ought to be kept dampened so that it shall be springy. Beyond the posts the earth should be turned over and raked so as to make a soft landing-place. The jumping costume should consist of a jersey suit rather than a linen blouse and trousers, because the knit goods cling to the form and keep the muscles warm. The trousers should never reach the knees, which have to be kept free. The feet are encased in shoes made of kangaroo skin, laced in front like running-shoes, and are worn without socks. The shoe of the jumping foot—that is, the foot you take off with—is made several ounces heavier than the other, and is about as heavy as a sprinter’s footwear. The heel is made of one-quarter-inch sole-leather, and has two spikes. Some men jump with one spike in the middle of the heel; but this is very bad, because when the jumper alights his heel-bone pounds on the spike, and this soon raises a stone-bruise. If you have two spikes fixed at the extremities of a diagonal drawn through the centre of the heel, this bruising is easily avoided. There are no spikes on the heel of the other shoe, but the heel itself is made slightly thicker. In the toes of both there should be six spikes. It may be well to say here that the jumping foot is usually the left foot, although this is purely a matter of individual taste. Page, Sweeney, Cosgrove, Baltazzi, and almost all of our successful jumpers, however, take off with the left foot and stride over the bar with the right. For the sake of uniformity and convenience, therefore, let us hereafter understand jumping foot for left foot. One of the striking features of the series of illustrations of pages 58 and 59 is that it proves that a high jumper practically steps over the bar with one stride instead of flying over it in a compact bunch, as he appears to do when watched by the naked eye. The bar in all these pictures was at 5 feet 8 inches, and each photograph necessitated a separate jump. This alone is enough to show in what excellent form the athlete worked, for a kinetoscope could not have caught the separate actions in one leap to better effect than these photographs have shown them in eight different leaps. Good form in high jumping is one of the prime requisites for success. It is only within the past few years that much attention has been given to this feature of the exercise, and it is no doubt for this reason that the record has been so steadily climbing. The picture of G. B. 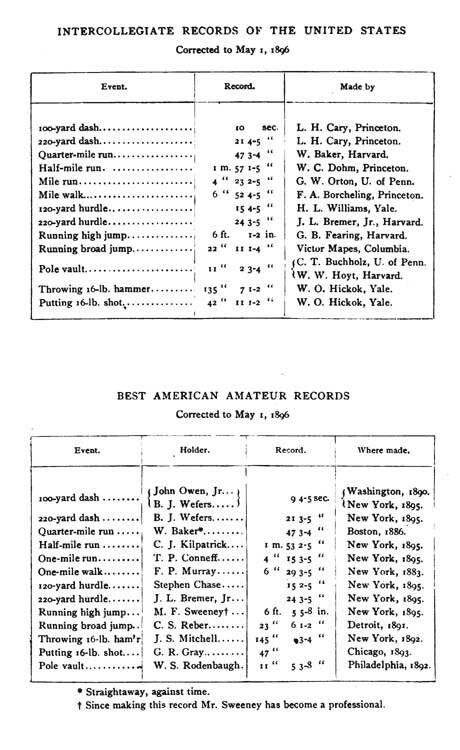 Fearing, the Harvard high jumper, on the opposite page, is reproduced from a photograph taken in 1892. He was a splendid all-around athlete and a clever jumper, but he had no form. His sole thought was to get over the bar, and form could take care of itself. 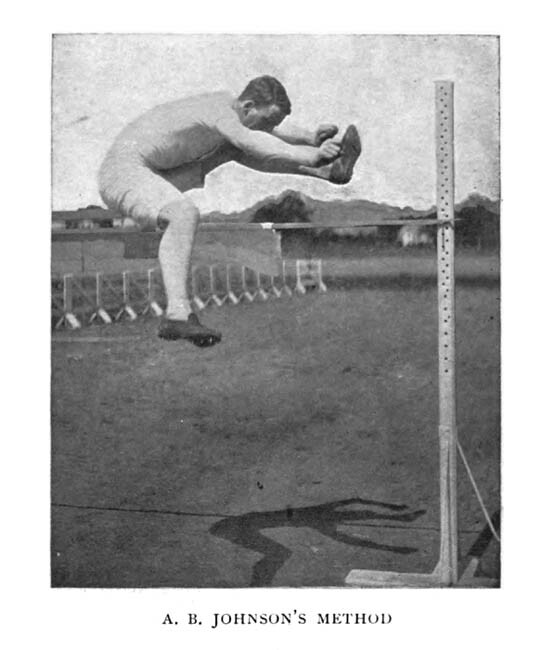 As he clears the bar in this picture both his feet appear to be curled up under his body, and his head is thrown forward and down. He seems to be almost reclining on his side, whereas Baltazzi, who is shown in the pictures on pages 58 and 59, makes the leap with his body practically perpendicular, although he necessarily bends forward in the motion which lifts the torso over the stick. Fearing’s form, as displayed in this photograph, does not give the same idea of power and assurance as that shown by Baltazzi. 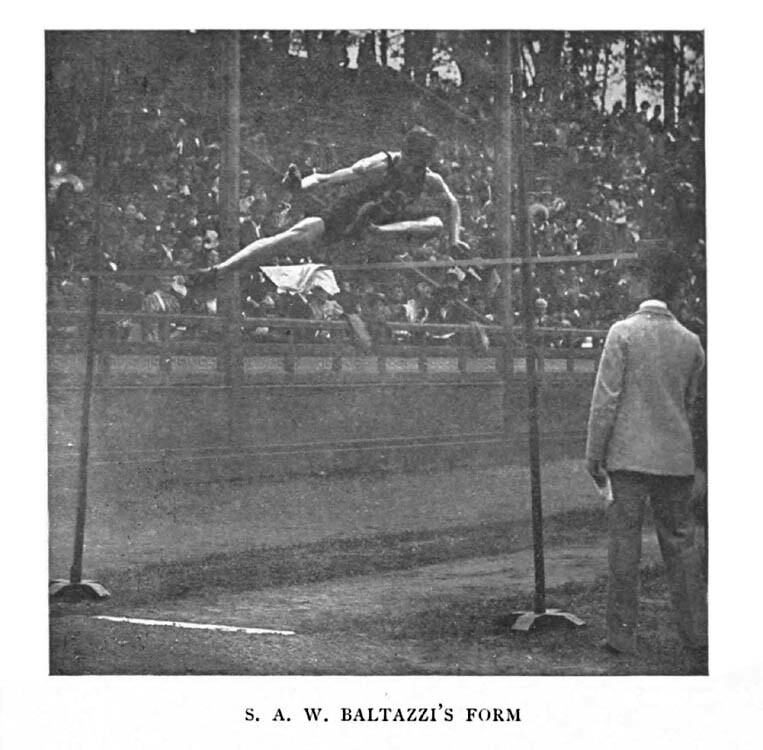 Sweeney, the world’s champion, jumps in the same manner as Baltazzi—in fact, Baltazzi acquired much of his style from studying Sweeney. 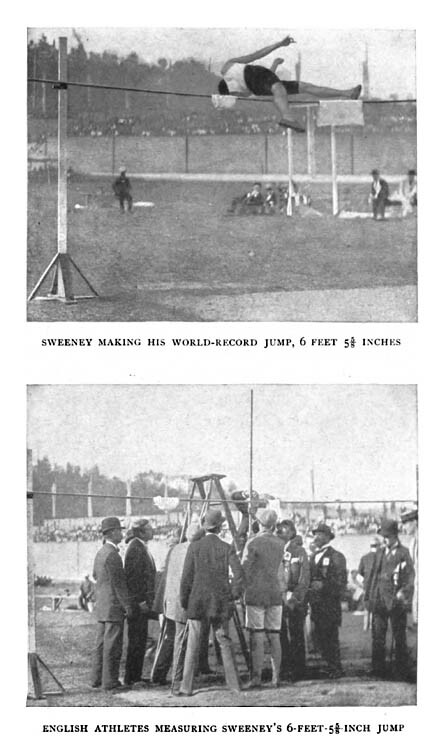 But there is one peculiarity about the champion’s jump which many people do not clearly understand, and so they have named his style the “Sweeney jump.” Any man who could go as high as Sweeney would have to clear the bar in the same manner. 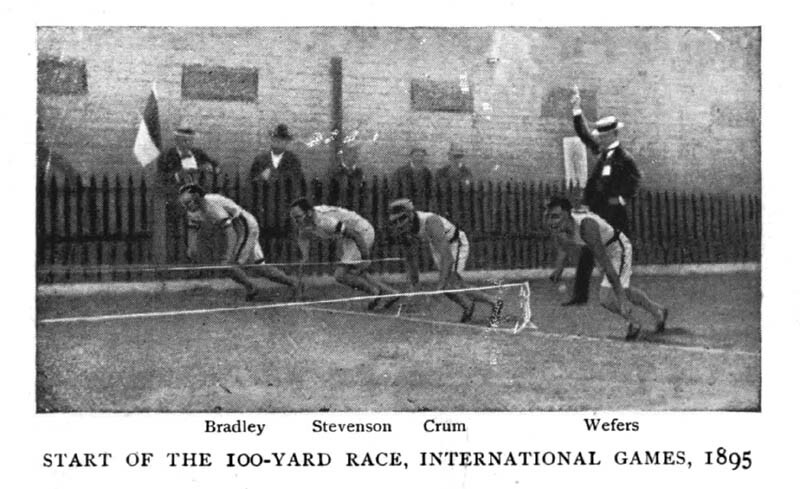 This peculiarity is shown in the photograph on the opposite page, taken at the International Games on September 21, 1895. Here Sweeney appears to be lying out flat on his back, instead of clearing the bar in an upright position. The upright position is all very well to maintain up to six feet, but above that every ounce of muscular power must be exerted in raising the trunk—the head and shoulders become a secondary consideration. 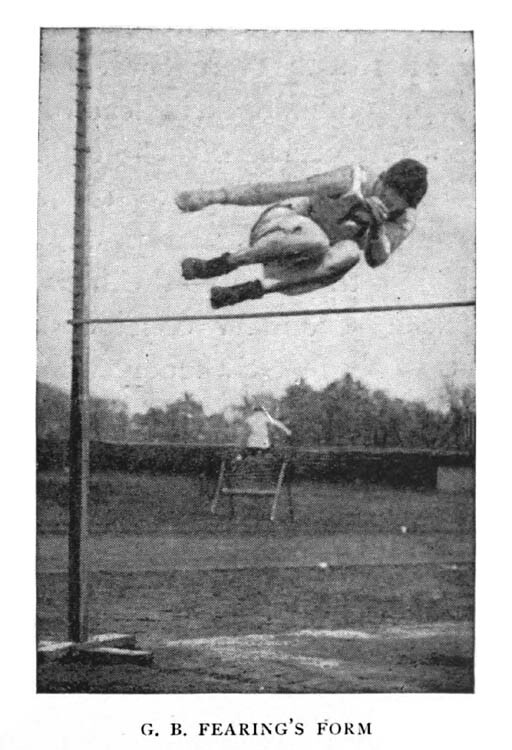 Thus, although up to six feet Sweeney clears the bar in an upright position, when it comes to a higher leap he springs as high as he can from the ground, and then heaves his torso and shoots his legs forward, twisting his body in the air until he comes into the position shown in the picture. He has to depend entirely upon the momentum of his run and the mid-air twist on top of the bar to get his shoulders and head over. 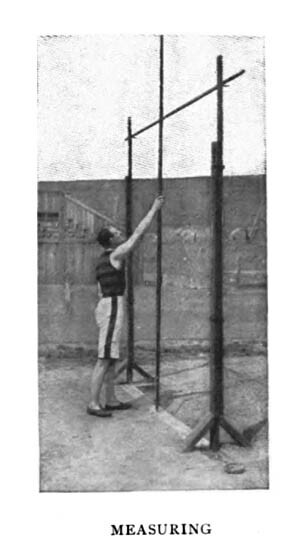 The Englishmen who came over with the London Athletic Club team were amazed at Sweeney’s performance, and even after he had successfully cleared the bar at 6 feet 5 5/8 inches, thus making a new world’s record, the Britishers were sceptical until they had measured the height of the central point of the cross-bar for themselves. English high jumpers, as a rule, have very little form. Ryan, the Irish champion, goes over the bar with both feet at once. Almost all other Englishmen run towards the bar at an angle, instead of straight down the runway, and “cut” over it,, first one leg and then the other. This style is well illustrated in the accompanying portrait of A. 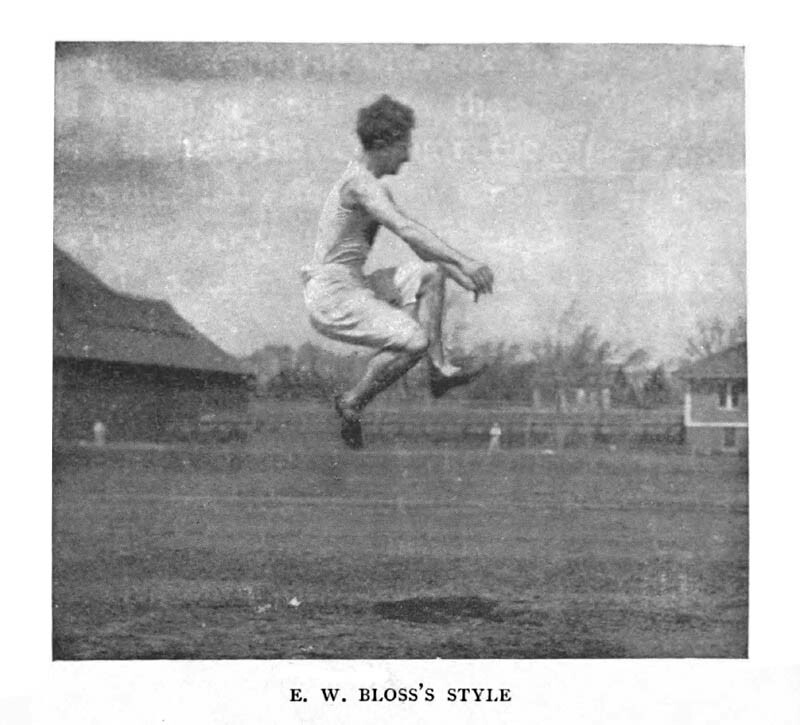 B. Johnson, who jumped for the London Athletic Club in the International Games of 1895. And now to return to the detail of the high jump itself. There is no rule that can be laid down as to how far away from the posts a jumper should start to run. The nearer the better, because less power is then wasted in the approach. Sweeney and Baltazzi both start about seventy-five feet back and run slowly down to a point within three long strides of the posts. This point must be measured and absolutely fixed by every jumper. He should then start in the middle of the runway and swing slowly towards the right edge of the cinder track, turning sharply to the left at this fixed point, and then taking his three strides as rapidly and with as much force as he can compel. This brings his left foot on the take-off, and gives his body a sort of twist that aids greatly in getting over the bar. A man who jumps with his right foot should swerve in towards the left edge of the track so as to get the “lift” on the left side of the body. The first illustration of the series, on page 59, shows the jumper as he starts. 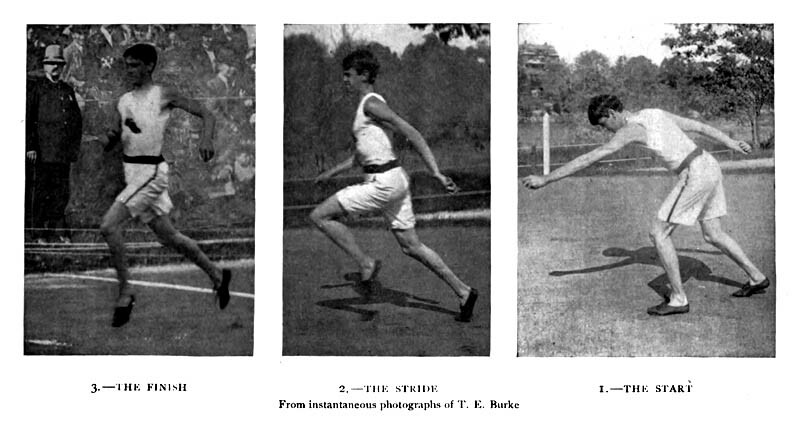 He takes an easy gait until he reaches his “mark,” then gets into his stride, and the second illustration shows him springing from the take-off. This spot is another that each individual must locate by experiment for himself. A good way for a beginner to determine how far from the bar to take off is to stand before it on one foot and lift the other until he can touch the cross-piece with his toes. He takes off as far back as he can thus stand on one foot and touch the bar with the other. This distance from the base-line between the posts to the take-off is usually equal to the height of the bar from the ground. A veteran can, as a rule, take off closer than this, but that is the result of long practice and experience. If you jump or take off with the left foot, all the work is done with that foot and that side of the body. If you jump with the right foot, the conditions, of course, are reversed. The present description is of a jumper who uses the left foot. Upon reaching the take-off, as shown in the second illustration of the series, the heel strikes first, as may clearly be seen from the heavy mark underneath it, and gives the power for the jump. The toe merely gives direction to the motion imparted by the heel and the big shin muscle which connects with it. The leap has now begun, and with the right foot rising the jumper begins to sail over the bar. His line of travel is a perfect semicircle, beginning at the take-off, and ending in the soft ground on the other side at exactly the same distance from the base-line of the posts. No. 3 shows him still rising from the ground, his right foot giving the direction of the leap. The muscles of the arms and back are now just coming into play to raise the torso and the left leg—and all the time the eye is firmly fixed on the bar. In No. 4 the right foot is just passing over the handkerchief, and the arms and back are seen straining with the exertion of bringing up the left leg. Notice that muscle of the neck. It connects with the muscles of the side and abdomen, and these harden like steel to force the quick motion that has to be made to lift that side of the body. The strain on this neck muscle and the working of the back and arms are even better displayed in No. 5, where the left leg is almost up, and is about to clear the bar. Considerable practice is required for this motion, because it has to be done very quickly. The left foot has to be brought in very close to the right thigh, and yet the sharp spikes must be kept from tearing the flesh. Note how the eye is constantly on the bar. In the next picture, No. 6, the bar has been cleared, the whole body is over, and the right leg has dropped. It is now no more used, except as a balance for the body, the entire work of the jump, as before stated, being done with the left leg. The jumper’s eye is still fixed on the bar, and not until he is well over it, as shown in No. 7, does he remove his gaze. As he clears the stick his back muscles give a twist to his flying form, and his right arm thrown into the air aids him in turning, so that he will fall facing the bar. The left leg has now passed the right, and is making ready to sustain the weight of the body on landing, while the right is thrust slightly backward to maintain a proper equilibrium. The strain on the back and arms is relaxed. In No. 8 he is just about to land, and the camera has given us a beautiful display of the looseness of the arm muscles, showing the right arm still in the air and about to drop as soon as the feet strike the ground. The body is lying along the curve of the semicircle through which the jump has been made. 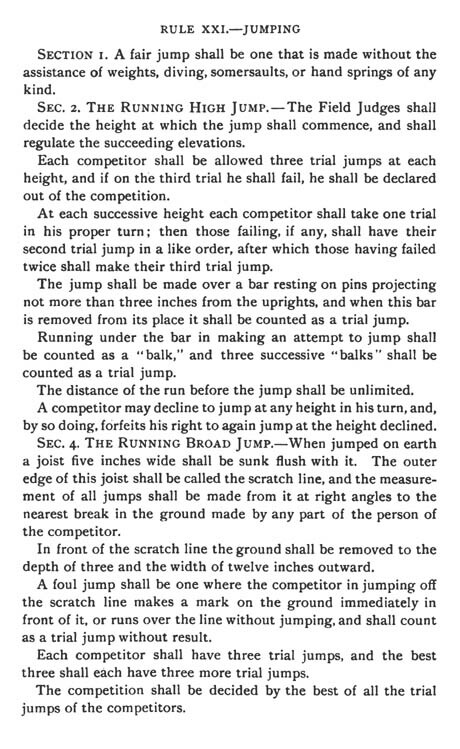 In a competition each competitor is allowed three trial jumps at each height of the bar, and if he fails on the third trial he is declared out. 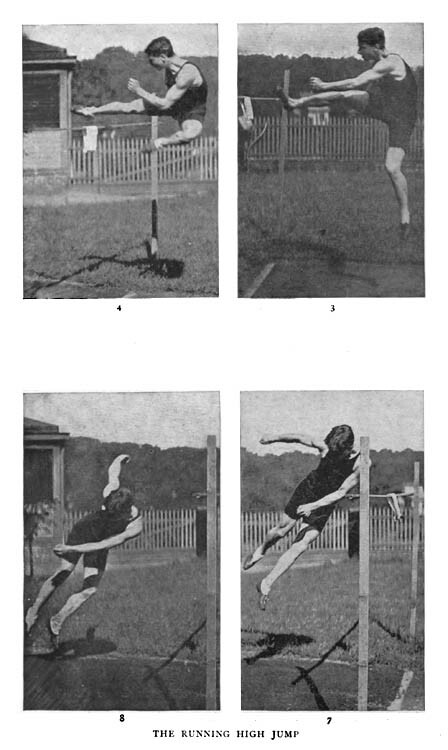 Running under the bar in making an attempt to jump counts as a balk, and three balks count as a trial jump; thus it is always better to balk rather than to attempt a jump if you do not come squarely on your take-off. A competitor may decline to jump at any height in his turn, but by so doing he forfeits his right to again jump at the height declined. 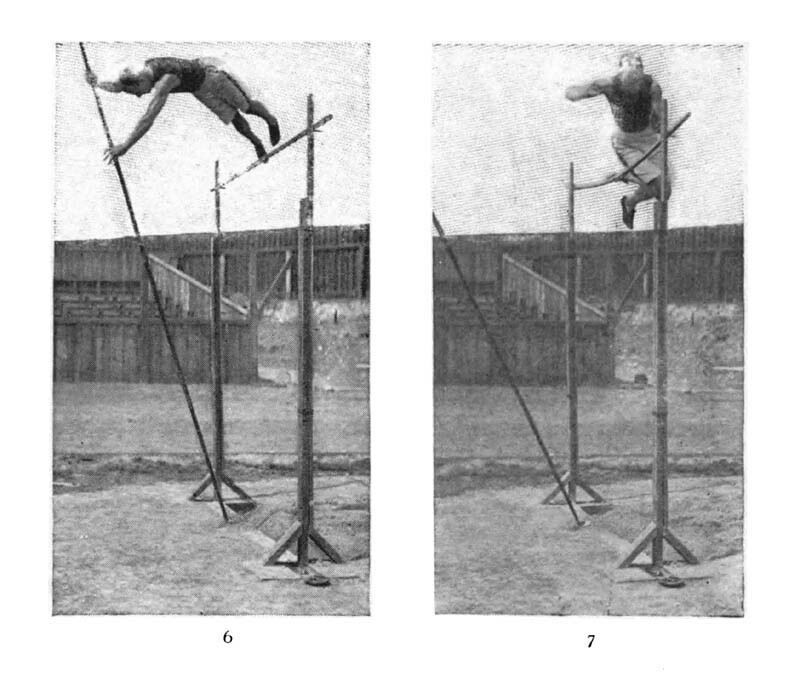 Many jumpers wait until the bar reaches a fair height before entering a competition, thus reserving their strength, but this may only be done by an athlete who is certain of his ability to clear the bar at that height. To become a successful broad jumper the athlete must, to a certain extent, combine the skill of the sprinter, the high jumper, and the hurdler, for broad jumping is a sort of combination of the other three. Like every other athletic feat, this one requires systematic work both of the body and the head, and persistent, continuous effort before any kind of form can be developed. The first difficulty for the novice to overcome is the laying out of his run and the arrangement of his take-off. These details are both of the highest importance, for although he may be a good sprinter and a good jumper, these two qualities are nullified if the take-off is uncertain. The run differs with almost every individual; each athlete must determine this for himself by experiment. 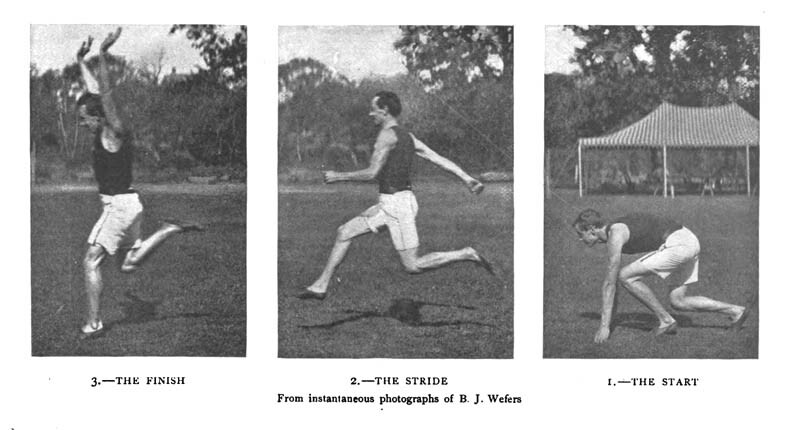 It is necessary to lay out two marks on the cinder-track; the first one must be a given number of strides this side of the take-off, and the second at a distance farther back, to suit the taste of the jumper. Bloss, for instance, counts back nine strides from the take-off to his first mark, and then goes back a dozen strides farther. 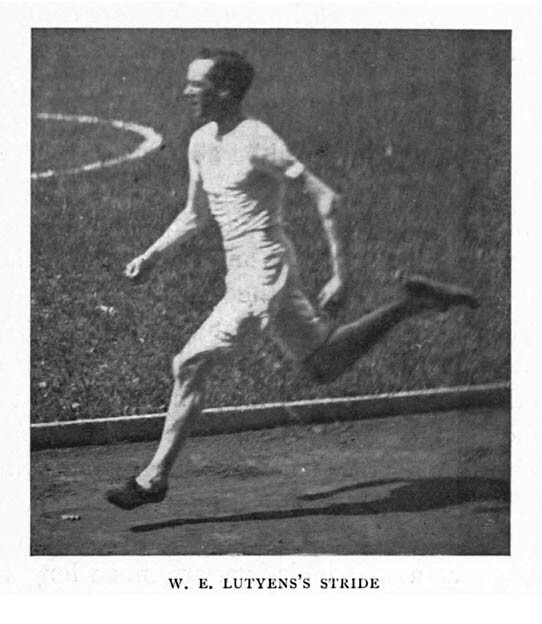 Lyons, whose jump is illustrated by the pictures on pages 66 and 67, goes back only eight strides from the take-off for his first mark, and about a hundred and five feet to the start of his run. Let us call, for convenience, the mark nearest the take-off the first mark, and the other the second mark. These have been laid out, so that the jumper may feel certain that if his jumping-foot, whether it be the right or the left, strikes fairly upon the first it will also come squarely upon the take-off, and the jump will be a good one. 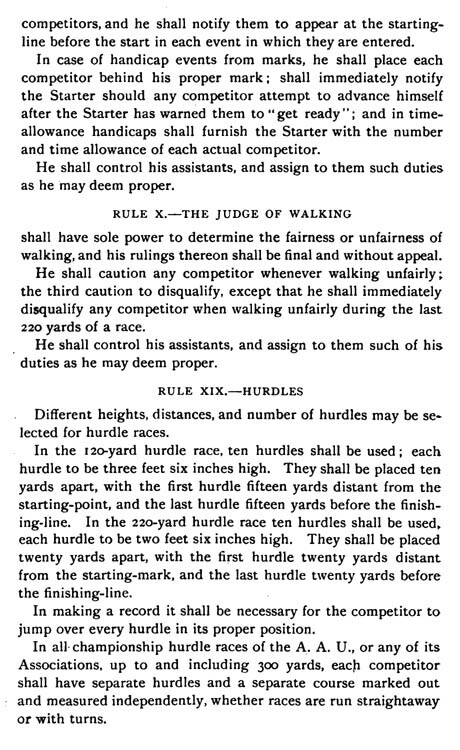 It sometimes happens in contests that the conditions of the wind or of the track will be such that these marks will have to be slightly altered; and every athlete should be careful to examine the runway before his event is called, so as to be able to fix the points that he must depend upon for his success. 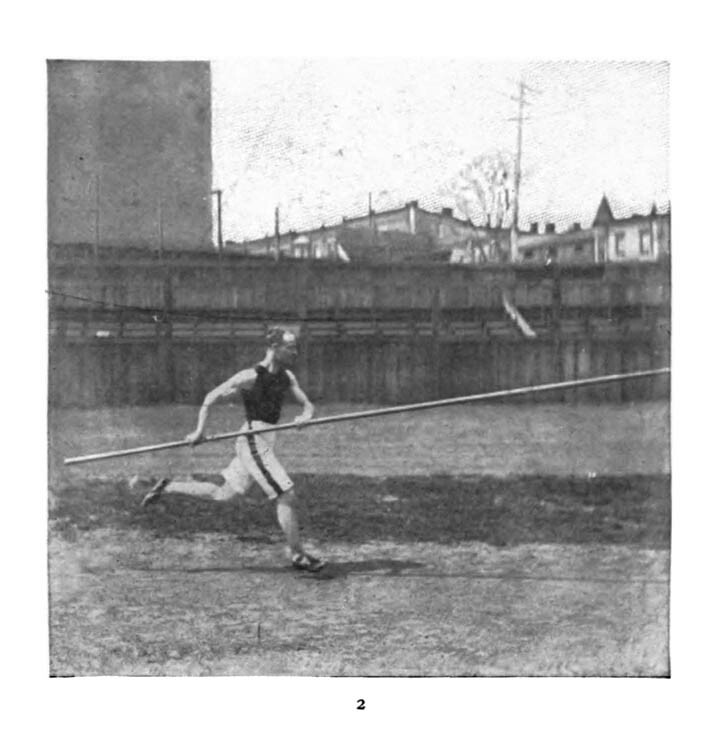 The position for the start of the broad jump is the same as that assumed by middle-distance and long-distance runners, and is illustrated by the first picture of the series on page 66. The jumping foot, in this case the right foot, is on the starting-mark, with the other slightly in advance. The sprinter starts down the track, measuring his strides carefully so as to come properly upon the first mark, and then he sprints at his greatest speed down the cinder-path to the take-off. If he has measured his distances correctly, he will land, as is shown in illustration No. 3, with his jumping foot squarely upon the take-off. If he feels that he has gotten out of his stride, it is better not to take the jump at all, but to stop, for overstepping the mark by a few inches will ruin the jump, and underreaching the mark will detract just that much from the measure of his effort. The act of the jump itself is where the greatest strain of muscle and nerve is required. Just before coming to the take-off, say at the last step, the athlete should gather himself together and crouch as low as his great speed will permit, and bring his jumping foot down as hard as possible upon the take-off, at the same time throwing his hands forward and upward. Bringing down the foot with such power serves to throw the body into the air, and this movement is aided by the lifting of the arms. The hardest strain comes on the back muscles, just as in high jumping. The eyes should be fixed on some distant high point rather than on the ground where the jump will probably end. This seems to give a better “aim,” and in many cases adds an inch or so to the distance. The fourth picture shows the jumper just after he has left the take-off. The next sees him well on his way, with his legs curled up close under the chin, and his arms reaching out far forward, so as to throw the balance as much as possible in that direction. The sequence of the three lower pictures of the series gives an excellent idea of the arc along which the broad jumper travels. As he comes down, the jumper should hold his feet as far forward as he can, in order to gain every inch that is to be had, and he should also keep his head and arms forward, so as not to lose his equilibrium and fall backward, thus making his jump void. The sixth picture on page 67 shows the correct attitude for the end of the flight through the air, the feet being well ahead of the trunk, but the arms and the head held so far forward that they will bring the body along, too, as soon as the feet dig into the soft earth below. The feet should be kept well together on landing in the jumping-box, and a good broad jumper will never allow himself to fall forward on his hands, but will always resume his erect position, and walk out of the soft earth instead of rolling out. In field competitions the jump is measured from the outer edge of the sunken board which marks the take-off, on a line perpendicular to it, to the nearest break in the ground made by any part of the person of the competitor. If the jumper oversteps the take-off, or scratch-line, as it is called, and makes a mark in the earth on the farther side of it, his jump is registered as a foul, but counts nevertheless as a trial. Training for broad jumping consists mostly of hard practice in sprinting short distances, say from seventy-five to a hundred yards. This is to acquire the highest speed for the run. High jumping should also be practised, but the athlete should not attempt to become proficient in the number of inches he can clear, but rather in the form with which he covers a reasonable height. A spin now and then over the hurdles will also do a great deal towards improving a broad jumper’s form. After the athlete has become more or less a master of his event, he will find that half a dozen jumps two or three times a week will be enough to keep him in practice, and I should advise him by all means to rest for three or four days before going into a contest. When the time for jumping at a field-meeting arrives, never try to do the best work on the first jump. Be satisfied to make your marks well and to catch the take-off squarely. Do your very best on the second jump and thereafter. 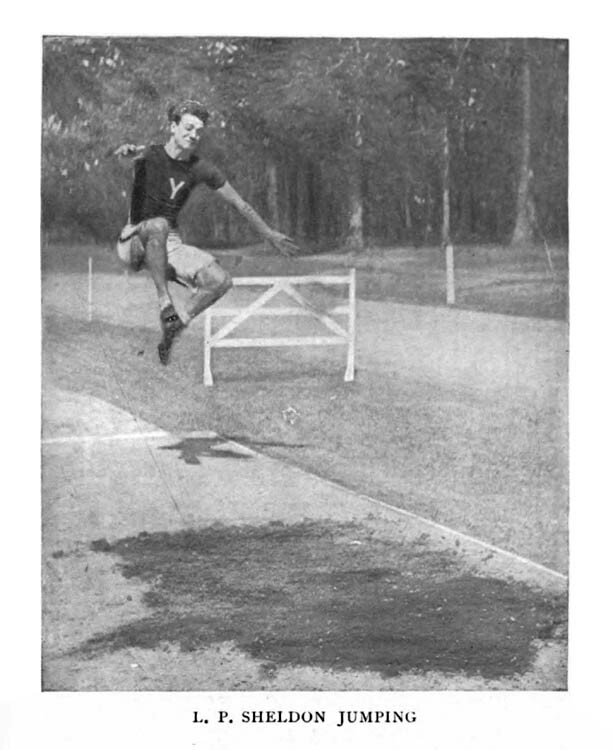 Before making the first jump, however, try a spin around the track, and take one or two short jumps on the grass, so as to be thoroughly limbered up; otherwise, if you have not softened your muscles, you may injure yourself on your first attempt, and be laid up, as a result, for weeks. 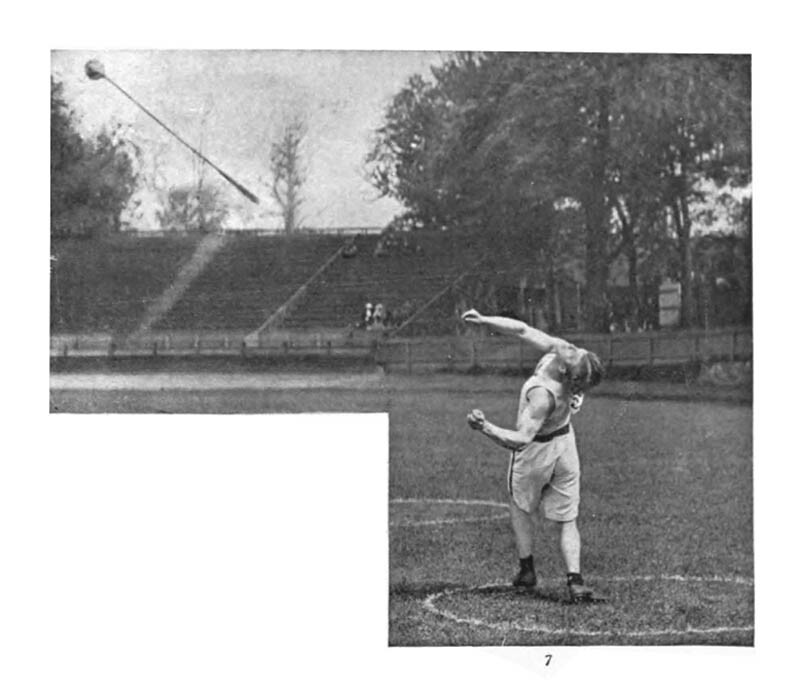 Throwing the hammer and putting the shot are the only two weight events now practised by college and school athletes, although many of the athletic clubs still retain throwing the 56-lb. weight on their cards. The last named, however, is merely a sort of exaggeration of the first, and only practicable for very large and very strong men. With the other two events it is different. Strength, of course, is a prime requisite, but to attain perfection in either of them the performer must combine skill with muscular power. The intercollegiate rules which govern the throwing of the hammer require that the hammer-head shall be a metal sphere, and the handle may be of any material. Up to within three or four years the handle used to be made of hard wood, but recently athletes have shown a preference for a flexible steel handle. The combined length of the head and handle must not exceed 4 feet, and the combined weight must be 16 pounds. The hammer is thrown from a circle 7 feet in diameter. In making an attempt the competitor may assume any position he pleases, but he must not step outside of this circle. 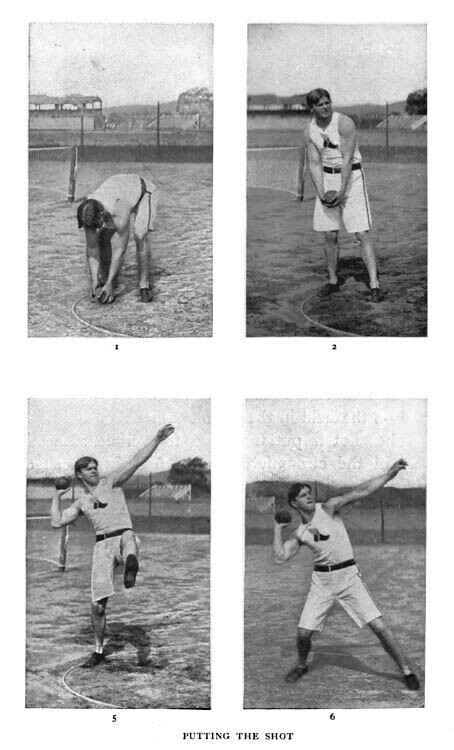 In a contest each competitor is allowed three throws, and the best three men in the first trial are allowed three more throws. The measurement of a throw is made, from the nearest edge of the first mark made by the edge of the hammer to the point of the circumference of the circle nearest this mark. 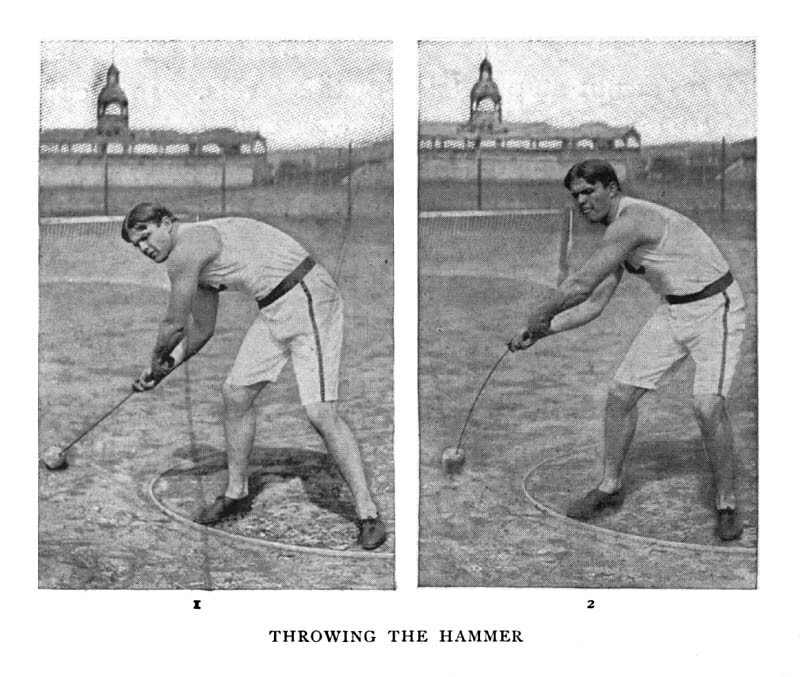 There are three kinds of fouls in hammer throwing, which are not measured, but which count against the competitor as throws. They are: letting go of the hammer in an attempt; touching the ground outside the circle with any portion of the body while the hammer is in hand; or touching the ground forward of the front half of the circle with any portion of the body before the throw is measured. The principal thing for a beginner to realize is that it is necessary to assume the easiest possible position when at work with the hammer, so as to give the muscles the fullest play. When the hammer is thrown around the head it should be kept as far as possible from the body; the arms should not be bent nor the muscles tightened, and the shoulders should be allowed to move as easily as possible. This ease of movement of course may only be obtained after long and assiduous practice; and it is only fair to say at the start that proficiency in throwing the hammer comes from long rather than from frequent practice. 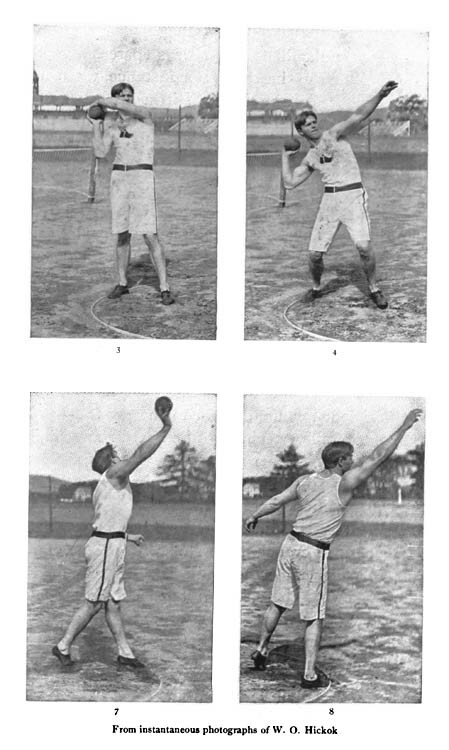 The most successful athletes in this line have begun by practising half an hour every day for weeks and months, trying rather to obtain control of the instrument than length of throw. As this is an event which cannot be practised indoors, the winter season must be given up to exercises that will strengthen the arms and the back, but outdoor work may be begun as soon as the snow is off the ground. After a man has become proficient in throwing the hammer, he will find an hour’s practice two or three times a week sufficient to keep him in form, and he ought to rest several days at least before entering a competition. The detail of the throw proper is a thing that must be carefully studied by all who wish to do well in the event. 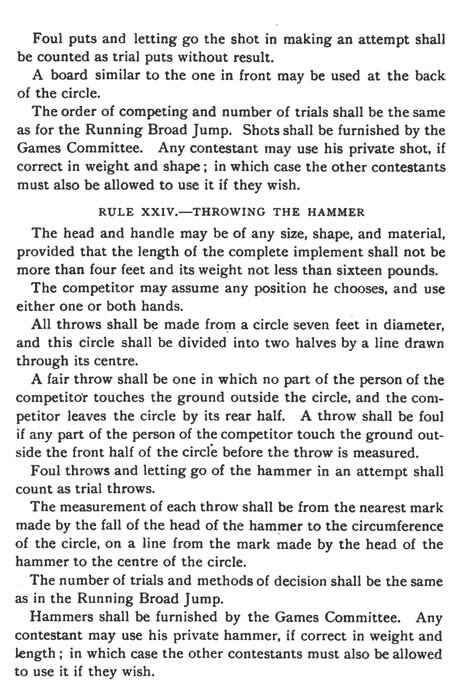 First, the athlete steps into the ring holding the hammer, the head resting on the ground outside the circle. He secures a firm grasp on the handle, leaning over so as to keep the iron head as far away from his body as possible. This attitude is shown in the first illustration on page 74. The second picture shows the hammer just as it is being lifted from the ground to be whirled around the head. It is plain to see that the arms are holding the instrument as far from the body as possible. As the heavy ball gains in velocity it stretches out so that the arms and the handle form a straight, horizontal line from the shoulders. 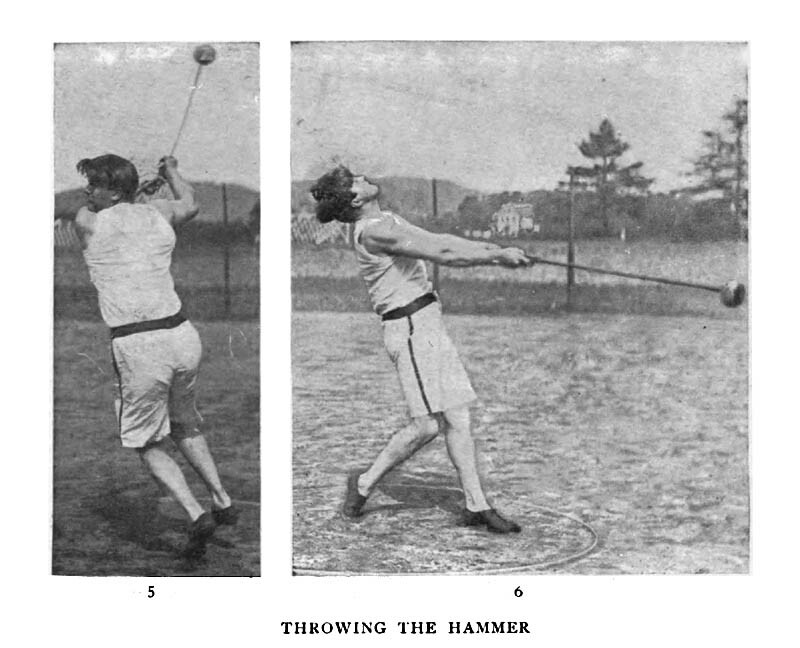 The fourth picture demonstrates the attitude of the performer as he swings the hammer about his head in order to gain the necessary momentum. The motion at the start is slow, but becomes gradually faster and faster, so that the top speed shall be reached just about as the athlete is ready to turn. It is the usual custom to throw the hammer three times around the head before turning. The fifth picture shows this turn. When this act is performed the hammer should be kept well behind the body, and the thrower should try to move his feet around as fast as he can, and never under any consideration should he allow the hammer to get ahead of the motion of his body; he must keep it following on behind, or else the hammer will throw him instead of his throwing the hammer. The reason given for jumping around on the last turn is that a man when proficient in this trick can gain about twenty-five feet on his throw. It is the Irish method of throwing a hammer, and has been in use in Ireland for several hundred years. The Scottish way of throwing, still in use in Scotland, is to stand still. This used to be the method in vogue in this country, but within the last ten years the A. A. U. adopted the Irish method, and two years ago the Intercollegiate Association followed suit. A man who has become accustomed to throw from a standstill has some trouble in getting accustomed to the turn, but as soon as he has got the knack of the twist he will greatly prefer it over the old method. The sixth picture shows the moment just previous to the final heave when the hammer is to be let go. This should not be done with a jerk, but the handle should be allowed to slip from the hands at the proper moment, otherwise any jerking will destroy the momentum obtained. The last picture of the series, on page 77, shows the attitude of the thrower after the hammer has left his hands, the weight of his body being thrown backward, so as to prevent him from stepping out of the circle. The hammer is thrown from a restricted circle, in the United States, in order to make the event more scientific. A strong man with very poor form might make an excellent throw sometime if he were allowed to follow it and to go where he liked in his efforts. The circle prevents this go-as-you-please method, and makes it necessary for athletes to acquire form; it also gives a definite place to measure from, so that there can be no dispute as to the exact distance for the measurer to lay off. In England, collegiate amateur athletes throw from a 30-foot circle. This gives them a great advantage, for the more turns you can take before throwing, the greater momentum you can get into your throw. The Englishmen use a 3-foot-6-inch handle, which, on the other hand, is a disadvantage to them, since the centrifugal force is lessened as the square of the distance from the centre. 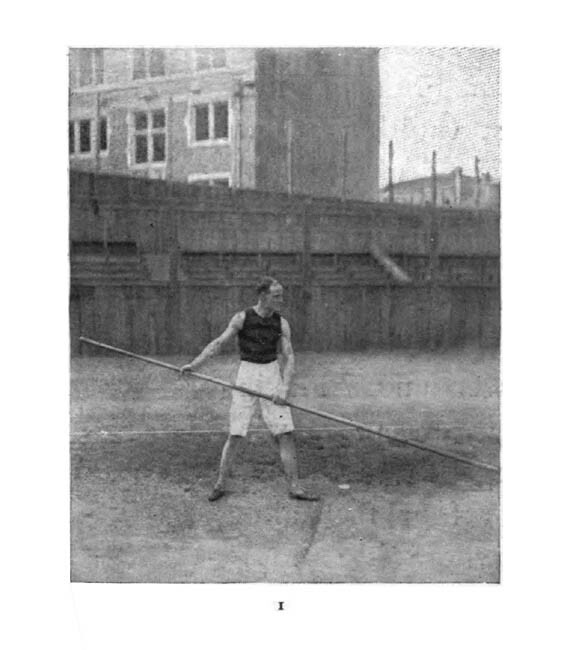 If athletes used a longer handle than the one accepted in America, which is 4 feet long, they could not throw the hammer so well as they do now, unless the performer were of unusual stature, because the head of the hammer would touch the ground in the first few turns and at the final lift. Although putting the shot and throwing the hammer are events usually performed by the same man in an athletic competition, it is a fact, nevertheless, that the two things do not go well together. The hammer develops the pulling muscles in the back and arms, while the shot, on the other hand, develops the pushing muscles. 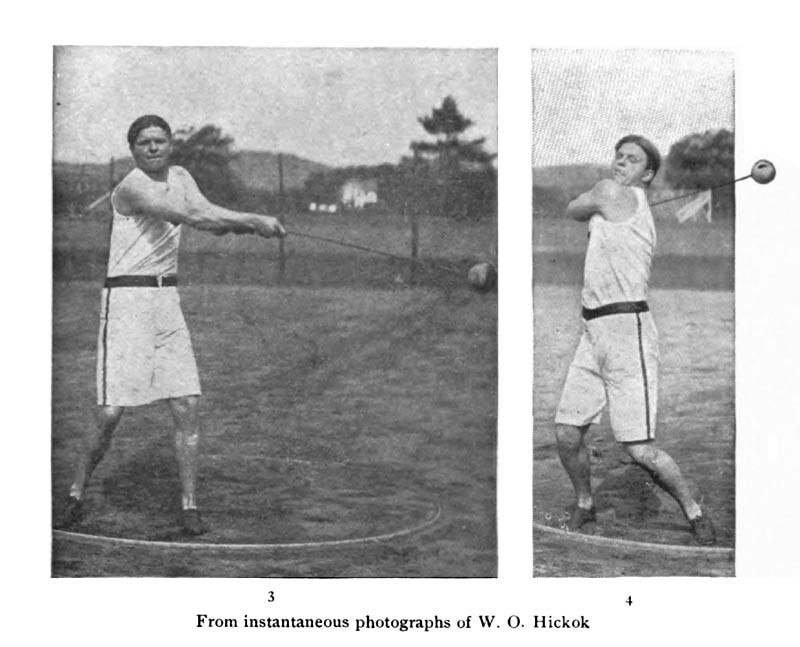 At one time Hickok, intercollegiate champion from ’93 to ’95, devoted himself exclusively to the shot, and soon got himself into such form that he could put 45 feet at any trial. Then he started in to practise with the hammer, and found his best throw measured only 110 feet—his best former record being 130 odd. He kept on systematically working then at both weights, but he soon noticed that the shot went down as the hammer went up, so that in a month he could scarcely do 40 feet. 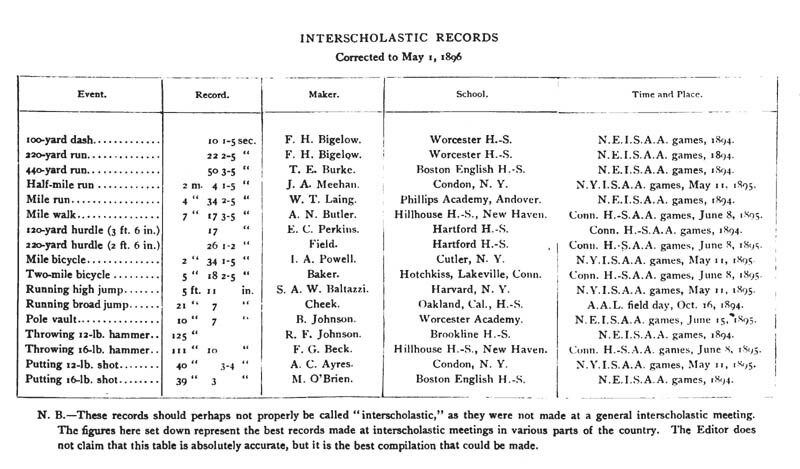 At the next Yale-Harvard contest he put the shot 44 feet, which he considered a lucky performance—and it was—although before training for the hammer event for the same contest he had put the shot over 45 feet. To become successful in this event requires long and persistent work, just as in hammer-throwing. Shot-putting is a great science to develop, and it usually takes several years before an athlete can really become proficient in the event. The beginner must first strengthen his arms, giving particular attention to the development of the triceps and deltoids. This is best accomplished by work on the parallel bars, and by pounding a bag, as in boxing. The latter exercise cultivates swiftness. Sprinting is also an important exercise for a shot-putter, for it teaches him to be quick and light on his feet—a most important feature of the general preparation. In addition to these things he should, of course, constantly work at putting the shot—in the gymnasium in winter, and on the field in the open-weather months. The shot is put from a 7-foot circle, along 4 feet of the circumference of which is placed a board 4 inches high. This is the so-called front of the circle, and the put is measured from this board to the nearest mark made in the ground by the shot. A fair put is one that has been made without any part of the competitor’s body having touched in front of the circle or on the top of the board before the measurement is made. 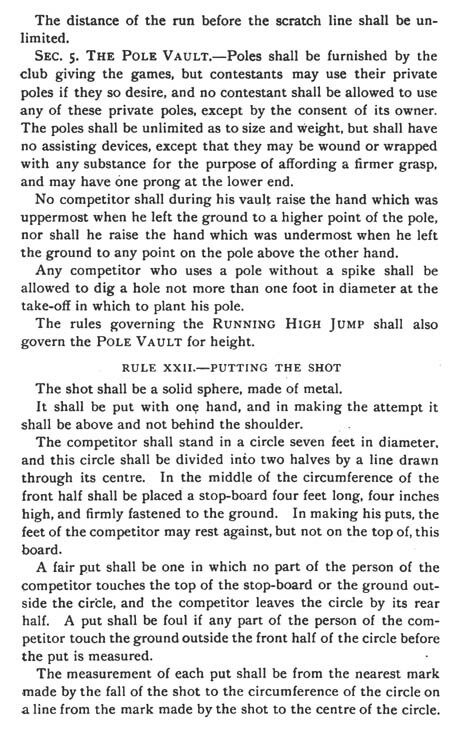 A put is counted a foul if the competitor steps over the front half of the circle or on the board before the measurement of his put has been made—and the foul counts as a trial. The careful athlete will always spare his right arm as much as he can. For instance, when he picks up the shot he will hold it in his left hand, and he will do the same while he steps into the circle and gets his footing. After this has been secured he will roll the shot over into his right palm—as shown in illustration No. 3 on page 83—and then he is ready to start. Assuming as easy a position as possible, let the shot be well balanced in the right hand. Do not grip it tightly. In starting off, as shown in the fourth illustration, place the whole weight of the body upon the right leg, holding your left arm forward as a balance. Then take a quick hop with the right leg, all the time keeping the shot as near the shoulder as possible. Upon alighting after the hop, touch your left foot to the ground—and it ought to fall very close to the board rim. This is the position shown in the seventh illustration. The eighth shows the next movement, which is the transposition of the feet. The correct attitude for getting across the circle on this hop is crouching. Then, as soon as your left foot touches ground, you bring it swiftly backward, throwing the entire right side of the body forward; and you turn half around, so that the right shoulder will be in the exact direction in which the shot is to be put. After the impetus upward has been given by the legs and body, shoot the arm outward with all the force at your command, the motion being just such a one as you would make with the clinched fist against the sparring-bag. This motion—the change of feet, the lift, the turn, the thrust—is a very rapid one, but the photographs illustrate it very well in the last two pictures of the series. Furthermore, this movement must be perfectly uniform from beginning to end, with no jerks and hitches; but it takes long practice to acquire a perfect smoothness. The shot must be allowed to leave the hand easily, and the forward effort of the put must be so regulated that the equilibrium of the performer will be maintained. The perfect performer allows his body to bend forward just to that point where, should he go half an inch farther, he would be forced to step out of the ring. The beginner should practise with the shot for a good period every day. He should work until he begins to feel tired, but after he has become master of the event—say in a year or so—he need practise but two or three times a week, and he will find that his form and powers are thus best retained. In England the university athletes put the shot from a 10-foot square instead of a 7-foot circle. This gives them a certain advantage over American athletes, for they get a longer run, and thus more speed, and hence a greater momentum at the end. Hickok can put the shot from two to three feet farther from a 10-foot square than he can from a 7-foot circle, and with practice he believes that he could do even better. 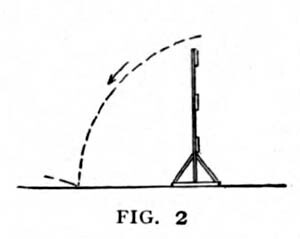 If an unlimited run, or series of hops, were allowed, the record for putting the shot would certainly be much greater than it is at present; but there is no doubt that the average form of athletes who take part in this event would be very much lower than it is now with the present scientific restrictions. Training for pole vaulting should begin in the gymnasium early in the winter. The arm and chest and dorsal muscles are the ones that must be developed, and these may best be strengthened by work on the chest weights, rope climbing, dipping on the parallel bars, and by using the travelling parallels. If you have no gymnasium to work in, a good exercise is to stand four or five feet off from the wall of your room and to fall forward on your hands and then push yourself back into an erect position. Do this a few times at first, increasing the number as you grow stronger. Sprinting is also as necessary an exercise for the pole vaulter as it is for the broad jumper. When the weather moderates, work should be begun and continued daily out-of-doors. For practice the vaulter must have two square posts similar to those used by the high jumper, only higher, bored with holes two inches apart above 6 feet, then one inch apart up to 8 feet, and half an inch apart from there up. The pegs should be between two and three inches long, and the bar of 1-inch pine should be about eleven feet long. I say the “bar,” but it were better to say “bars,” for the vaulter will do well to buy a dozen at a time, as they break very easily. The posts are placed ten feet apart at the end of the runway, which should be made from eight to ten feet wide, and as long as possible—say fifty feet. Like the high-jumping and broad-jumping runways, it is made of cinders, rolled down hard, and must be kept well dampened, so that it may be springy. Beyond the posts the earth should be turned over and raked, so as to make a soft landing-place. This landing-box is usually divided from the cinder-path by a sunken board running perpendicular to the upright posts, and across their bases. The costume for a pole vaulter should consist of an entire jersey suit, although many of the best men seem of late to prefer linen trousers. The advantage of jersey trousers or tights, however, is that they keep the legs warm, and, consequently, the muscles more limber. The shoes are the regular jumping shoes, made of kangaroo-skin, and fitted with six spikes in the toes and two spikes in the heel of the foot that takes off. These two spikes should be fixed at the extremities of a diagonal drawn through the centre of the heel, to prevent stone-bruising. The best vaulting-poles are made of selected, straight-grained spruce, and are somewhat expensive, on account of the number of sticks that have to be destroyed in the making of one good one. A good pole costs from $4 to $5. It should be sixteen feet long, and fitted with an iron spike at the lower end. 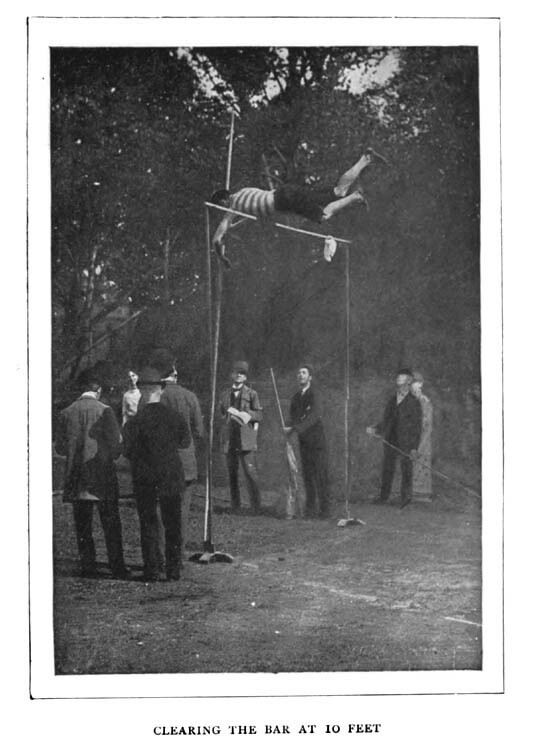 Having purchased your pole, wind it with tape for a distance of three or four feet along that part where it is to be held by the hands in vaulting. When you first begin to vault, it is best to place the bar at about 6 feet, and to work over this height until you have mastered the knack of the event, which is undeniably a complicated one. As in high and broad jumping, the athlete must lay out his take-off and his run. No rule can be set down for either of these things. Some vaulters like a long run, and depend entirely upon speed to carry them over the bar, while others take a short sprint, and throw all their force and energy into the leap. But whichever method is adopted, both the take-off and the starting-point remain fixed spots on the runway, and must be experimented with until found, and then carefully fixed. Whether in practice or in competition, and no matter at what height the bar may be, always measure your pole before vaulting. This is done by stepping up to the posts and holding the pole upright until it touches the bar. Let it fall back then, and grasp it with the lower hand one foot below the point where it touched the cross-piece. For a vaulter who takes off with the left foot, the lower hand is the left hand. For a man who takes off with the right foot, it is just the other way. For the sake of convenience and clearness, let us understand that we are now speaking of one who takes off with the left foot. 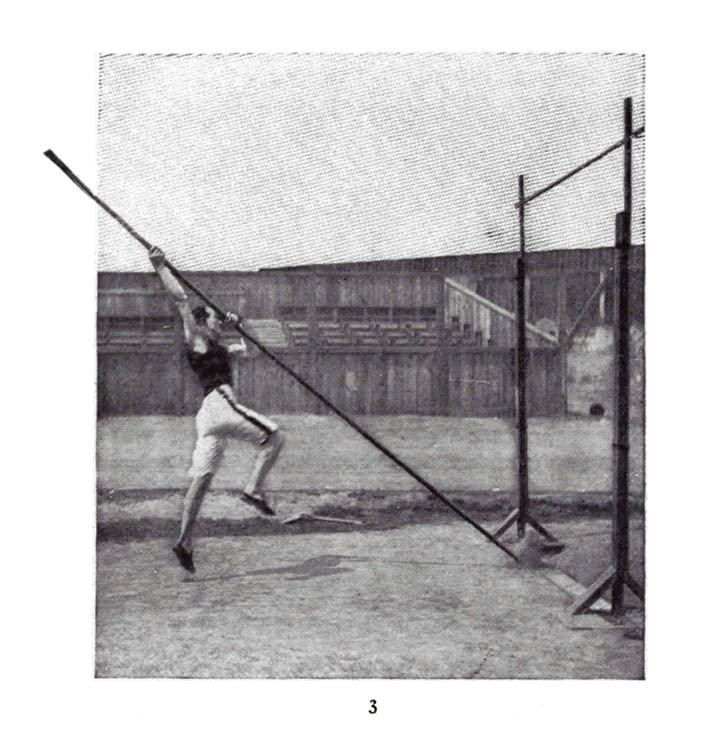 Having measured the pole, the athlete seizes it with both hands, thumbs up, the left hand forward at the spot indicated, and the right hand from 2½ to 3 feet farther up. He then retreats to the spot which he has determined upon as his starting-point. He stands in the middle of the runway, with the pole pointing straight at the uprights, and he fixes his eyes on the bar. From this moment he does not remove his gaze from that pine stick, or from the handkerchief which may be hanging from it, until he has made his leap. He should never look to see where he is placing the pole to vault. The pole will take care of itself. For going down the runway with the pole, styles differ. 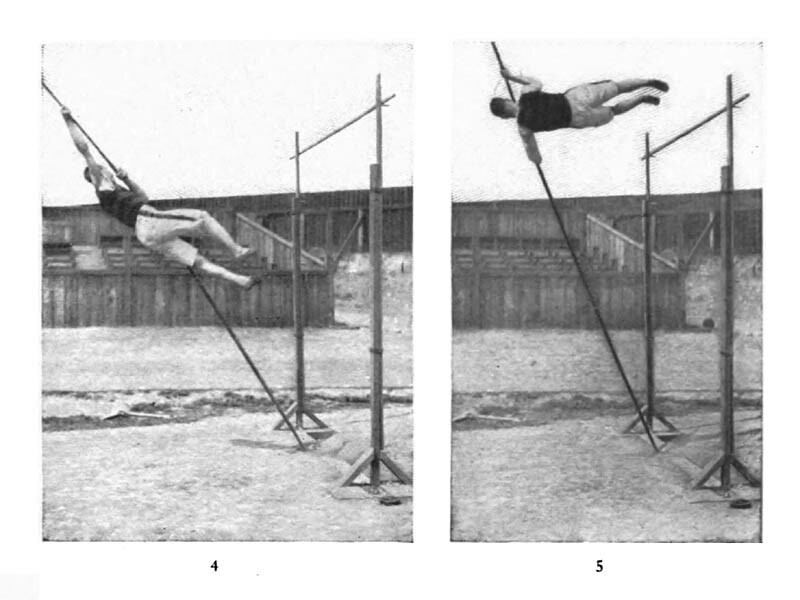 Some vaulters hold the pole well up over the chest, while others (like Mr. Buchholz in the accompanying illustrations) holds the pole well down. The novice will find it better to keep his right or higher hand well up under his head. The athlete starts down the runway at full speed, and when he reaches his take-off he plants the pole firmly into the ground with all his force, and springs straight for the cross-piece. The moment his body leaves the ground the right arm stretches taut (illustration No. 3), and his body swings towards the pole. The motion of the body as it rises is a turning one, the object being to twist and face the pole, so that when the proper height is reached the back will be towards the bar, so that the heels may be lifted over. 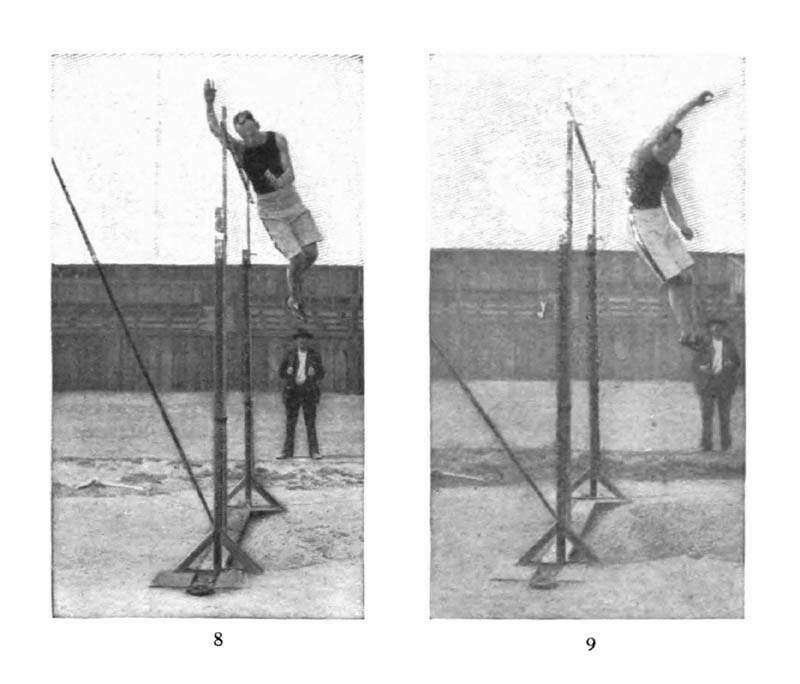 The fourth illustration shows the vaulter halfway up from the ground to the bar, which in this case was at 9 feet. He has turned half around, and by the time he has nearly reached this height he is still farther around. (Illustration No. 5.) This picture shows the beginning of the working of the arms and of that twist which is so necessary to carry the body over at great heights. The working of the arms begins just before this twist is made, and consists of pulling with the right arm and pushing with the left. This lifts the body, and the twist carries it over, together with a strong push against the pole at the last moment, when the athlete feels his upward motion is changing to a fall. After the pole has been let go, all is plain sailing. You have either made your vault or you have not, and all you have to do is to fall free, or bring down the bar with you. 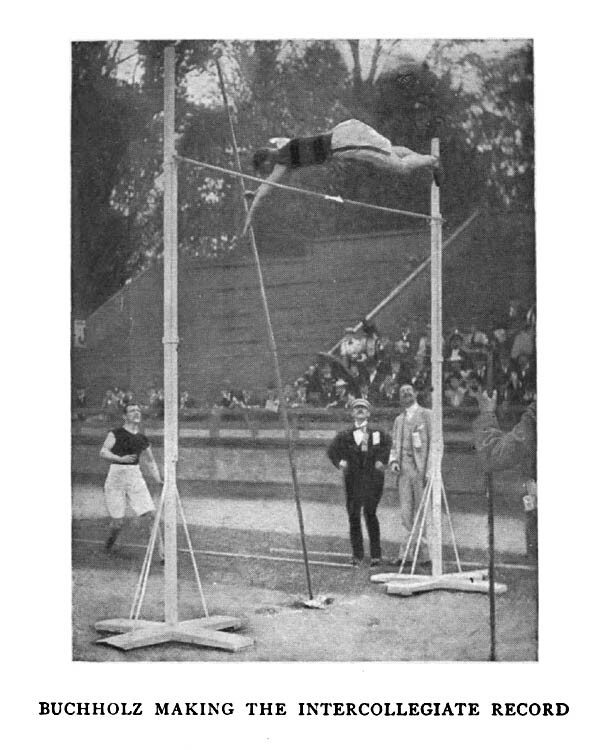 No effort that the athlete can now make to avoid the bar will avail him, as the motion in mid-air is practically uncontrollable after the pole has been abandoned. It is easy to learn how to fall limp into the soft earth below, and there is never any danger attending this drop. It will be noticed in the illustration that the twisting motion imparted on the hither side of the bar turns the body so that the athlete falls with his back to the posts, having performed one complete gyration in mid-air. This is not by any means a necessary element of the event, however, for many men drop facing the runway. It is not permissible in vaulting in America to move the upper hand on the pole. The lower hand may be brought up, and Hoyt, the Harvard vaulter who won that event at the Olympic games of 1895, usually does this. In England, “climbing the pole” is allowed, and athletes there frequently bring the lower hand up above the other. Some of them manage to make better records by this method, too. When training for this event the novice should not vault oftener than fifteen times a day, and he should never work with the pole more frequently than three times a week. On the intervening days he should do light work at sprinting. 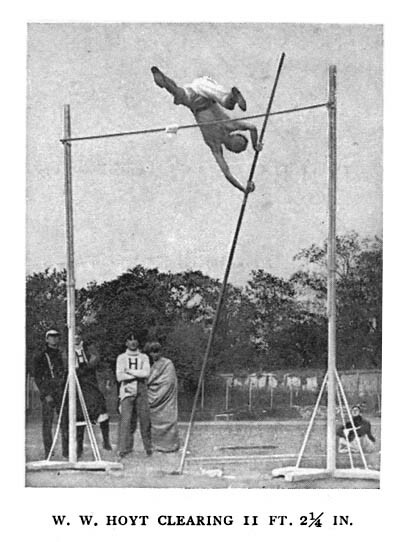 Take every height three times, and then raise the bar, as it is frequently possible for a man to clear a higher mark after failing at the point below. On one day each week try to see how high you can go. 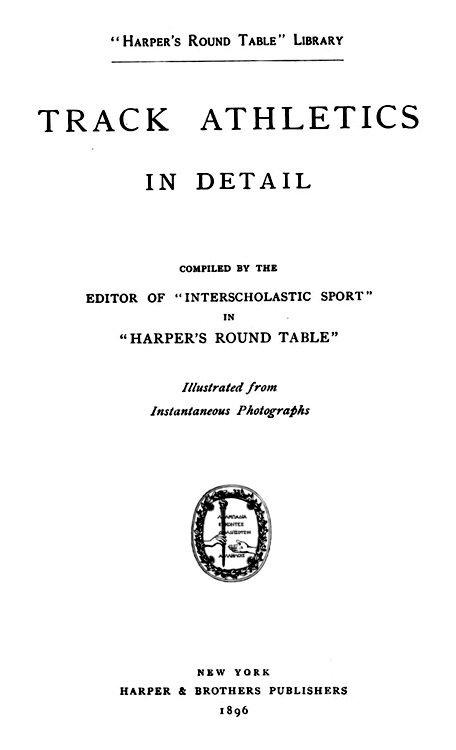 Although bicycling may not properly belong in the same class with the track and field sports treated in the foregoing chapters, it is yet a sport so universal and so popular at the present day that it has seemed advisable to insert a few chapters on the subject in this volume. It is a fact that with all the bicycle riding done in this country to-day probably half the riders do not sit their wheels correctly, and consequently increase their expenditure of physical labor and derive less benefit from the exercise. There is perhaps still a question as to what is the proper position for the best and healthiest bicycle riding. Some good riders sit in one position, have one length of pedal stride, and use one kind of ankle motion; while others, who ride just as well, believe in something entirely different, and prove it by riding long distances or at great speed without either injury or discomfort to themselves. The suggestions given here must stand, therefore, simply as suggestions, which can only be proved by each individual to be correct after he has followed them for some time, and has found them of benefit to himself. They are followed by many good road riders and racers, and that is some recommendation; and for the practical pleasure of wheelmen they are probably as good as can be had. In the first place, it is taken for granted that the reader rides a bicycle for pleasure, not as a business; that he is a road rider and not a racer on a cinder-track. In other words, it is for the amateur road rider that these words are intended. Whoever, therefore, wishes to ride correctly, and with the greatest ease and power, should, to begin with, take the ordinary upright position—such a position as will correspond to the upright position assumed by any one who is walking, or by a good horseman in the saddle, or by a cross-country runner in his run. The prime requisite is that the lungs should have ample space to breathe in. The chest ought to be thrust well out, the shoulders thrown back, and the head held up, so that there will be no crowding of the veins that send the blood into the head. This position is the same as that assumed when horseback riding. Of course, at first no one can keep himself in this position all the time, but you should try to keep as near it as you comfortably can. Comfort is really the basis of all such positions, and while, to a certain extent, comfort is the result of habit, still an upright position is more natural to some riders than to others. This upright seat is dependent on itself. That is to say, you should get in the habit of taking it so easily that, supposing you could ride without handles, you would sit thus nevertheless. In other words, you should not depend on your grip on the handles for support. The hands and arms are not needed as you sit in a chair, nor as you walk, nor as you ride a horse, except as guides, in one case to guide the horse, in the other to maintain your equilibrium while walking, and finally on the bicycle to steer the wheel and keep yourself balanced on it. A glance at the illustrations on pages 102 and 103 will show the difference between a correct and an incorrect road position. 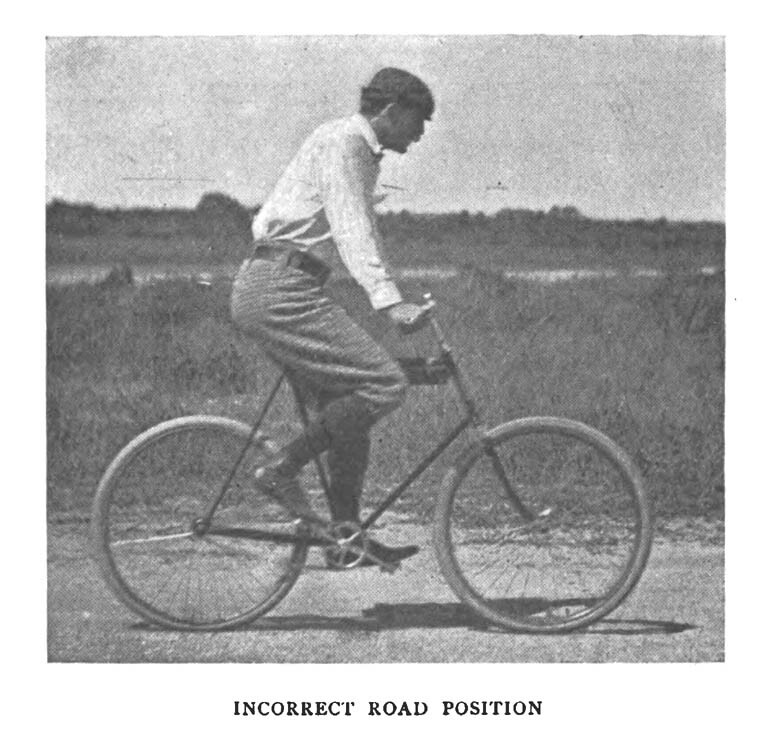 The incorrect position shows a rider “leaning” on his hands and arms. This seat is a very common one, unfortunately, and if you examine the next twenty riders you meet, especially those who have ridden fifteen or twenty miles, you are likely to find most of them in this condition. The arms are rigid, the body is leaning on them. This thrusts the shoulders back until the shoulder-blades touch each other. The lungs and neck are pushed forward, and almost every single muscle and nerve in the upper part of the body is out of place. The result is that neither heart nor lungs get a good opportunity for action, and the shape of your upper body is slowly but surely being deformed. In the other position, the correct one, the rider could at any moment take his hands from the handle-bar and not alter his position in any way. The two contrasted speak for themselves. It may, of course, be said that when a rider becomes tired with riding, the incorrect position is a great rest. In the first place, this is not true if he has faithfully learned to ride in the upright seat. Then the other becomes uncomfortable. In the correct position the wheelman has his arms a trifle bent at the elbow, so that when he goes over any unevenness in the road his arms give, and he avoids the shaking of his whole body by the jolting, to say nothing of the certainty of giving his wheel an unpleasant shaking-up. 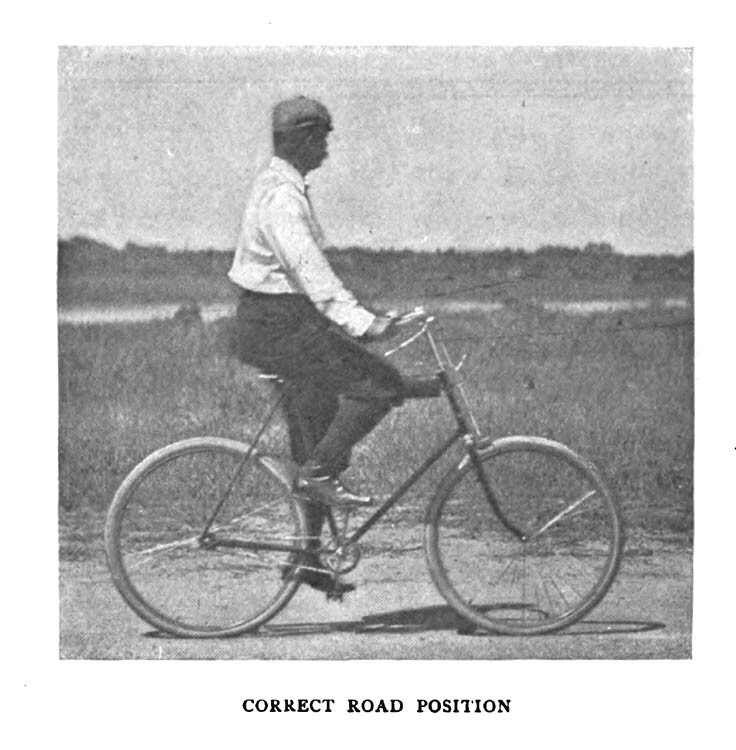 In the most modern bicycles the position of the rider is almost that of a pedestrian—that is, the pedals are almost under the saddle, so that he treads directly up and down. This helps him in keeping his seat without the aid of hands and arms, and it makes all the muscles of the legs and thighs work in their proper places, and the whole action of the body becomes natural. 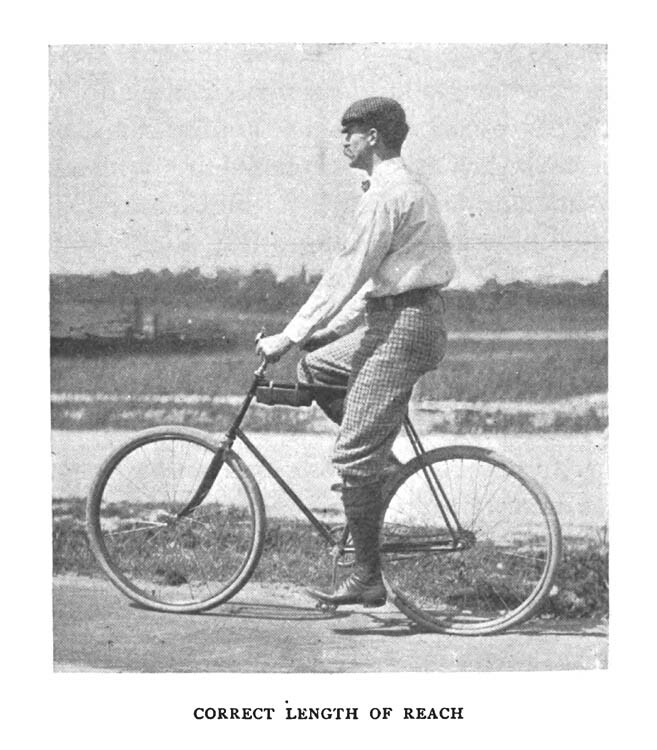 All this can be seen in the illustration of the correct position, and there can hardly be a question that this is the natural position for a man to take when he mounts his wheel for a run of a few miles. It naturally brings part of the weight of the body on the pedals, relieves the very uncomfortable weight on the saddle, and helps a rider to balance himself without the use of handle-bars, thus avoiding the “wriggling” of the wheel, which is so tiresome and so deadening to a steady road gait. The racing or “scorching” position is a difficult one to represent in a photographic reproduction, because each man has his own particular ideas, and as most men who race make a study of the subject, the result is that there are many different theories. The general principle is, however, to get a strong purchase on the handles, in order to give yourself greater power in thrusting down on the pedals, and at the same time to curl up the body in order to give as little resistance to the air as possible. Any one who has ridden against the wind will realize what an enormous difference the air makes in his speed, and this is, of course, multiplied when the rider is going at a record-breaking gait. But there are correct and incorrect racing positions, and the two illustrations on these pages will give a suggestion of them. 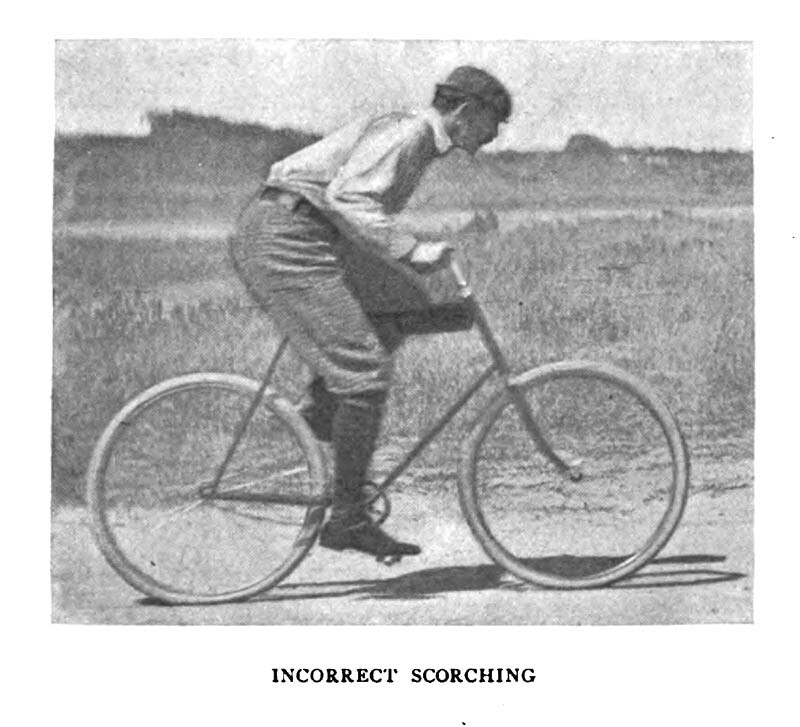 A “scorching” position cannot be taken on a bicycle where the saddle and handle-bars have been arranged for the upright road position. 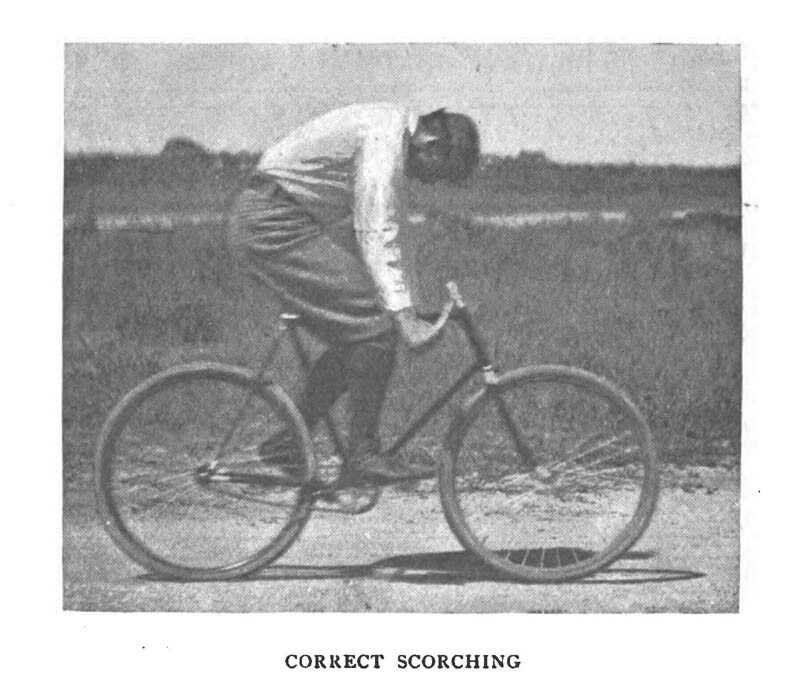 In the correct scorching position, shown on page 106, the handles are very low down, and the seat is raised and tipped forward, so that the rider, while pulling up strongly on the handles, is practically only leaning against the saddle, and putting all his weight on the pedals. The back is curved rather than straight, because a much greater purchase can be obtained in this way; and, indeed, the curved back makes a much more vigorous and symmetrical attitude. The important point to remember is, that you cannot assume the scorching position and the upright road position on the same bicycle without changing the handle-bars. To start out for an afternoon run through the country in a scorching position is absurd. A halfway position—one between the upright and the scorching position—is worst of all. Another important point in road-riding is the height of the saddle above the lowest point in the arc described by the pedals. Experience has shown that when the pedal is at its lowest and you are sitting squarely on the saddle, your heel should be on a level with the toe of the boot and your knee a trifle bent. Or, to put it differently, it should be possible for you to place the arch of your foot on the pedal and follow it around in its circle without absolutely straightening your leg to its utmost. Or, still again, as other people describe it, you should be able to put the toe of your shoe under the pedal and keep it there all the way round, the leg being straightened at the longest stretch. The illustration representing this shows the correct length of stride, and by referring to the cut on page 108 you will see what results when the rider has raised his seat so high that he is obliged to let his toes point down with a straight leg in order to follow the pedal around. The illustration, representing too long a stride, shows by the wrinkles in the rider’s trousers and shirt that the rider is compelled to lower not only his hips but his whole side and shoulder, and, of course, the same action is repeated alternately on the other side. As these photographs were taken by an instantaneous slide, and the riders were in motion, they are all actual positions during riding, and, as such, illustrate exactly what happens in each case. In the matter of too long a stride there is real danger to health in the long-run. The wheelman makes many thousand revolutions in a week, and many of us ride throughout a good part of the year, and any one can see in a moment that this constant working of all the vital parts of the body must be anything but healthful. Furthermore, aside from the question of health altogether, a wheelman becomes quickly tired out with his continual shifting. He may not know what is the cause of his weariness, but it is sure to be partly due to his riding in that way. There is no reason why a rider should want to have a long stride. It does not give greater speed, and it actually detracts from the power of his stroke. And now a word as to the ankle movement. The force applied through the foot to the pedal at the moment when the latter is one-quarter way round the circle from the top, or, in other words, half-way “down,” is the most valuable and powerful. Just as in rowing, the strength put into the oar when it is exactly at right angles with the boat is the most valuable. And, furthermore, the earlier or later the strength is applied to the pedals the less and less powerful it becomes so far as sending the wheel ahead is concerned. If you press down hard when the pedal is nearly or fully down to its lowest point you are scarcely sending the wheel ahead at all, and all your exertion goes for nothing. Practically speaking, in order to get the best of your strength in at the quarter-circle point you should begin to push, and push vigorously, the moment the pedal has passed by its highest point. The push should be quick and short, and should stop as soon as possible after the quarter-circle point has been passed. There is an instant of rest there, and then the heel should be raised a little, and a sharp upward and backward pull made on this same pedal at the same instant that the downward push is being made on the other pedal with the other foot. As a result, the rider is pulling up with one foot while he is pushing down with the other, and there are therefore two distinct motions with each leg during a single revolution of the pedal. Many riders only push downward, and allow the pedals to rise of their own impetus, but they waste a part of the force of each revolution by doing this—not one-half, perhaps, but fully one-third of what they might easily put into it. As a result the heel takes a different position relative to the toe at different parts of one revolution. At the top and bottom the two are on the same level, but the heel goes down quicker than the toe and comes up quicker. This is very tiresome for the beginner, and he soon finds the calves of his legs aching sharply; but in time he will become accustomed to it, and the increased amount of speed which he gets out of his machine will be surprising even to himself. 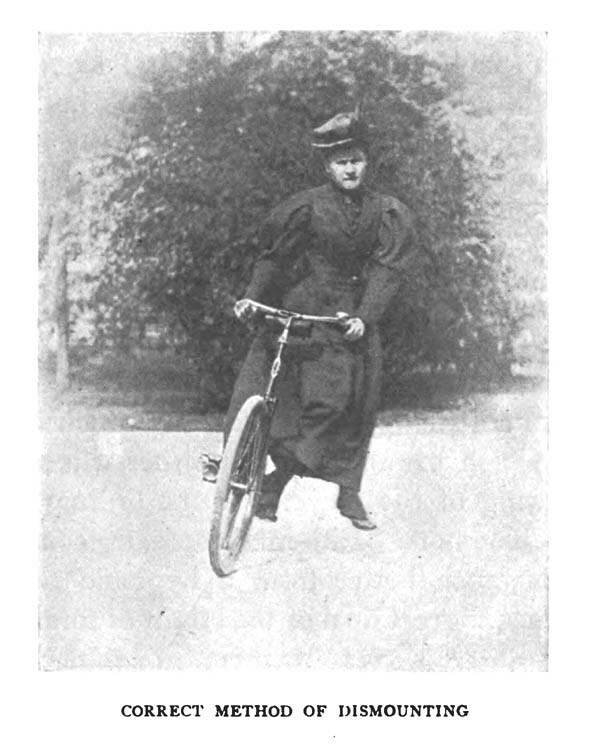 It is fully as important that women should ride properly as it is that men should do so, and if they will follow carefully the few words of instruction given here they ought to find little trouble in becoming masters of the bicycle. When sitting on a bicycle a woman should assume an upright position, practically as when walking. 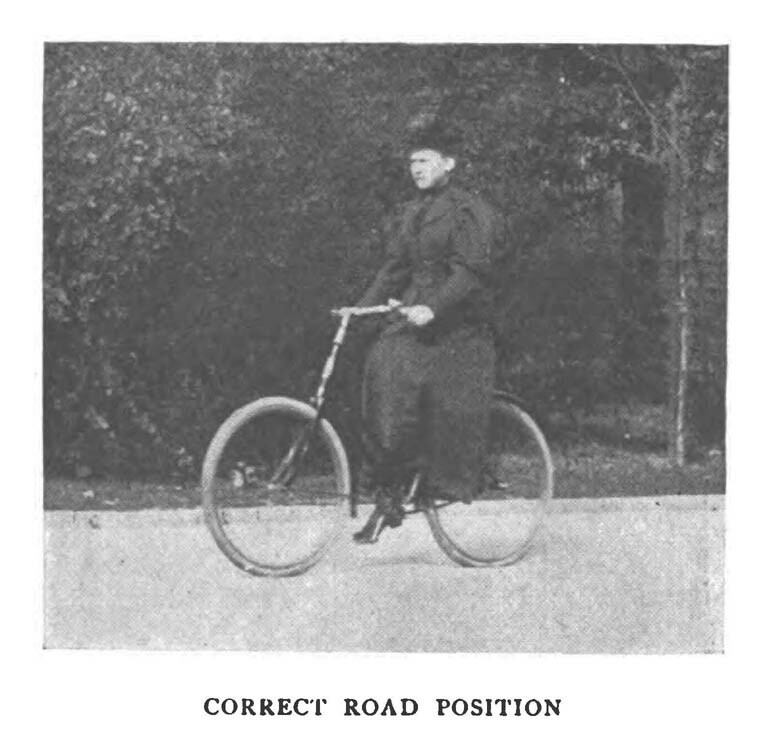 The saddle should be broad and flat, and, while most of the weight of her body rests upon the saddle, it is nevertheless true that she should put as much of her weight upon the pedals as possible; this not only makes riding and balancing easier, but it distributes her weight over the machine, both to her own comfort and to the safety of the wheel. Sitting perfectly upright, she should be able to place the arch of her instep squarely on the pedal when it is at its lowest point in the arc, and in that position her knee should be practically unbent, although, it is perhaps a trifle better if the knee is what might be called “sprung” a little. At all events, the body should not sag from one side to the other as the pedals turn, and when the rider is forcing the wheel ahead with the ball of the foot on the pedal, the knee will never be straightened entirely if this rule is followed. There is no advantage whatsoever in trying to secure a long reach; it does not help in any way, and it makes it more difficult to send the machine ahead either faster or slower. This is particularly noticeable in going up a hill. Women, as a rule, do not have the fault which many men have of leaning forward far over the handle. They are more apt to sit upright than most men; but they have one fault which should be corrected, and that is the position which the handles occupy in relation to their bodies. A girl should sit upright, and when she places her hands on the handles her arms should be slightly bent at the elbow. It is a common thing, however, to see, the arms so much bent that the forearm forms almost a right angle to the upper arm. This is not only uncomfortable, but it deprives the rider of the purchase which she needs when forcing the machine ahead or going up a hill. In other words, it is much more difficult to pull on the handles when the arms are bent to a right angle than when they are almost straight. On the other hand, the fault of leaning the weight of the body on the handle-bars should be avoided with the utmost care, as that forces the shoulders back and the chin forward on the chest, and in time distorts the whole symmetry of the upper part of the body. Mounting and dismounting, especially the former, should not be tried until the novice has learned to keep her balance easily while riding. Then mounting will come more or less naturally, since the difficulty in this operation is not so much to get on the machine, as to start the wheel soon enough after gaining the seat to avoid falling off. To begin with, a woman should grasp both handlebars firmly. By means of the hands the bicycle should be held absolutely perpendicular, neither leaning towards her person nor away from it. Then, standing on the left of the machine, she should step over the gearing with her right foot and place it on the right pedal, which is moved just forward of its highest point in the arc, so that the first pressure which comes on that right pedal will force the machine ahead as fast as possible. Having placed her right foot on this pedal, without bearing any weight on it, she then steps into the position over the gearing which will bring her weight as nearly as possible immediately over the centre of gravity of the machine. 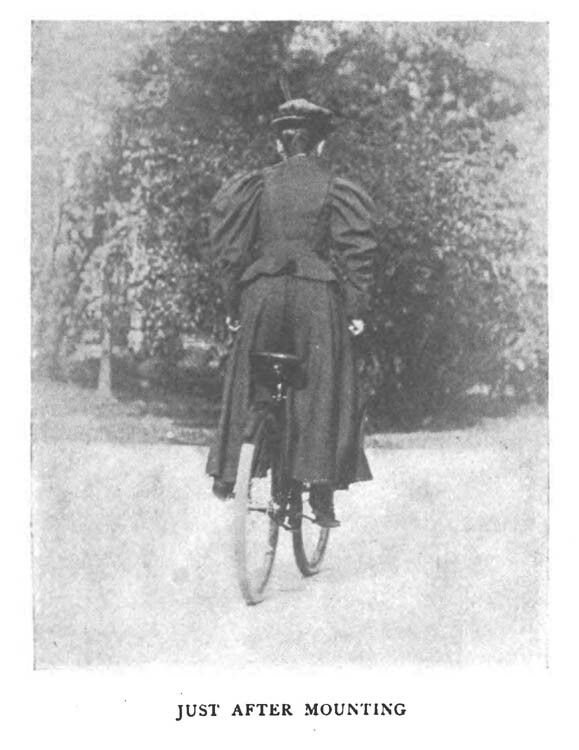 Having arranged her skirt so that it will be symmetrical when she mounts, she merely rises by stepping up on the right-hand pedal, and sits into the saddle by a slow, easy movement. Her weight on the right-hand pedal starts the machine forward, pulls the saddle in under her, and gives the velocity to the bicycle which she needs in order to keep her balance. One of the most important things about women’s bicycle-riding is the ability to dismount not only gracefully but at once in case of necessity. In this, as in mounting, there is no jump anywhere. 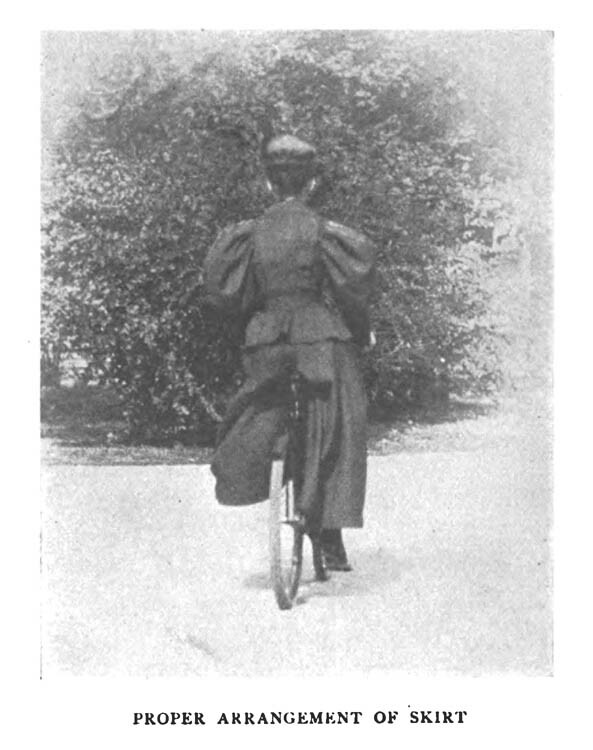 The rider simply catches the left pedal as it begins to rise from the lowest point in the arc, and, bearing her weight on that pedal, allows herself to be forced upward out of the saddle. This not only brings her into a position to step out of the machine, but also brings the machine to a standstill, or practically so, unless she is going at a high rate of speed. When the pedal has nearly reached the top, and the machine is as near a standstill as possible, she steps, still bearing her weight on the left pedal, out on the left side of the machine, putting her right foot over the left foot, and letting the right foot strike the ground first. Both mounting and dismounting are slow, even movements; there is no quick jump about them, and the motions are all gradual. As soon as you attempt to leap into the saddle, or leap out of it, you are almost certain to disturb the equilibrium of the bicycle itself, and then catastrophe is the result. We are just now in the midst of a change in ideas concerning a woman’s bicycle costume. No woman who has ridden ten times fails to complain of skirts, be they never so well made. They catch in the rear wheel. They make a sail to catch all the wind when the wind is blowing against you, and only a bicyclist knows what a head-wind really means. They are continually in the way. On the other hand, trousers do not seem just the thing for girls to wear to-day. Some time we may all come to the regulation knickerbockers for a bicycle costume, but just at present a woman who wears them appears to be immodest. As a matter of fact, however, modesty and ladylike behavior do not depend on the costume, but on the bearing and character of the rider herself, and it is only necessary for us to become accustomed to seeing women wearing any kind of a bicycle costume to think it the proper thing, and probably some kind of bloomers or divided skirt is less noticeable and more modest than a skirt which flies about as you ride along the road. The best thing for a woman then is a divided skirt which is close fitting, which cannot catch in either wheel or in the gearing of the bicycle, or the ordinary gymnasium bloomers. Either of these, especially the latter, is much better from a hygienic point of view, since a great deal of the strain of forcing the machine ahead is saved by them. In time we shall probably have a regular woman’s bicycle costume, which will be a combination of knickerbockers and bloomers, and then when people once become accustomed to it, they will wonder how under the sun women ever rode with long skirts. As to the question of how great a distance a woman shall ride in a day the answer seems very simple. 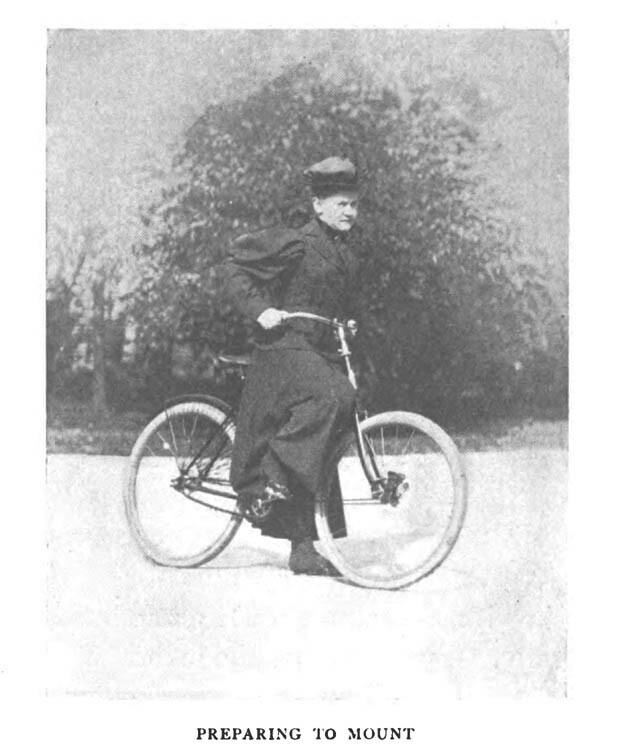 A woman must remember that she has not been accustomed to severe physical exercise, that she would not start out at once to run five miles without stopping, and that she consequently should not ride ten miles on a wheel either the first time or the thirtieth time. This seems very simple to read in print, but the fact is that most girls want to ride fifteen miles as soon as they can get along on a road by themselves. The difficult thing is to stop just before you begin to feel the slightest sensation of weariness. There are girls who can ride twenty, forty, or sixty miles in a day, but this is because they have begun gradually, and increased their distances by degrees as their bodies got into good condition. The average girl of fifteen ought not to ride more than five miles in any one day until she has taken thirty rides within two months—that is to say, until she has ridden at least once in every two days. Then she should not exceed ten miles in a day, or at one time, until she has ridden a bicycle half a year. After this she can estimate about what she can do without tiring herself, and she can gradually work up to twenty miles at a time, without ever having that fagged feeling which is a sure sign that the thing has been overdone. Considering the great number of riders of the wheel at present, it is astonishing how few really know anything about their mounts. A casual visit to any bicycle repair shop will conclusively dispel all doubts as to the truth of this assertion. Here you will find long lines of wheels awaiting repairs, some of the damages, of course, being serious, but the majority are unruly valves, punctures, and bearings out of adjustment. 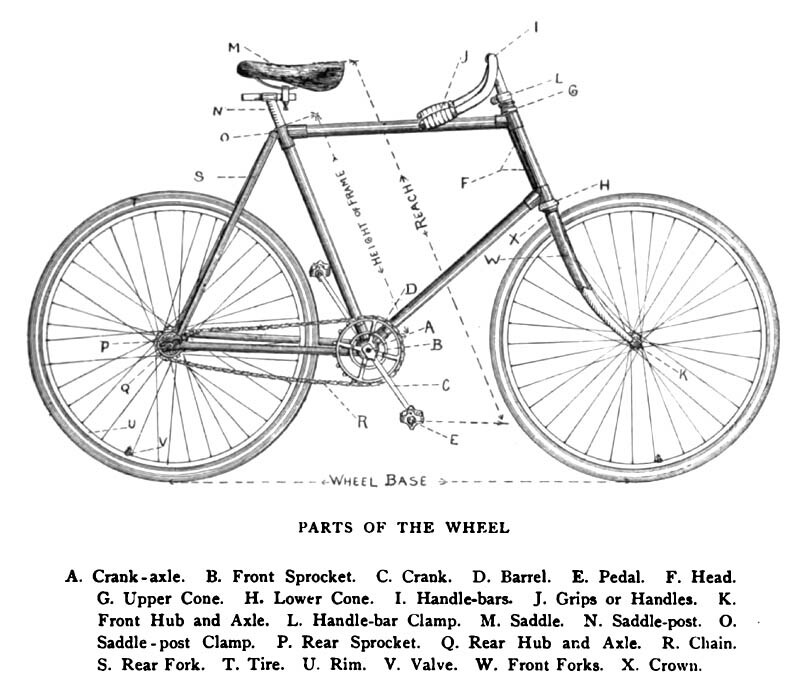 Particularly noticeable is the number of wheels in which a slight knowledge of bicycle construction would have enabled repairs to be made at home. How frequently one sees a rider, wrench in hand, dubiously surveying his wheel at arm’s-length, now tightening a nut here or loosening one there, in a vain endeavor to fix in this manner something that is out of order and prevents his wheel from running properly! But beyond this fact that something is wrong, he has not the slightest idea of the nature of the trouble. Or again, another enthusiast is deluging every visible chink in his bicycle with oil in the hope of finding some mysterious squeak, the location of which would be an easy matter if the position of the different bearings were understood. It is conceded without exception by all wheelmen that a fair knowledge of the construction of a wheel is essential to its proper care. Perhaps the most important thing to be considered is the care of the bearings. In the advanced stage which bicycle construction has reached today there are a large number of ball-bearings in a machine—in fact, there are balls wherever there is friction, however light. These bearings should have careful adjustment. Perhaps a glance at the sketch of a wheel bearing will make the construction clearer. Of course the bearings of different makes of wheel vary, but the principle is the same in all. The little steel balls are the only medium by which the weight on the bearing is transmitted from the rim to the cone (hub and axle). 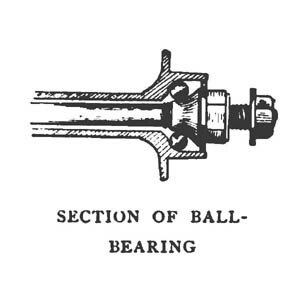 To have the bearing work properly and with the least possible friction, the cone must not be screwed in so tightly as to jam the balls in the rim, or the wheel will run hard; at the same time it must not be unscrewed so as to allow too much play of the balls, or the wheel will “wobble.” Most bearings have a flattening on the projection of the cone, between the hub of the wheel and the fork, that can be caught by a wrench, enabling the cones to be tightened or loosened by screwing this one only. Some have a thumb-screw in place of the device mentioned, and other makes adjust the cones by screwing the axle. In the adjustment of a wheel’s bearings, whether front or rear, a good test to use against too tight a cone is to raise the wheel clear of the ground, and, turning it so that the valve of the tire is on top, or nearly so, see if the weight of the valve will cause the wheel to rotate so that the valve will describe an arc, like a pendulum, each swing gradually diminishing in length. If the cone is properly adjusted, the valve should swing back and forth for some time. Of course the rear wheel will not swing as long as the front, the valve having to impart motion to the sprocket and pedals. If the cones are too loose, by gripping the wheel by the rim you will be able to slide it back and forth on the axle. The most important bearings in the whole wheel are those of the crank-axle. Here the whole strain of the propelling power comes. The adjustment of these cones is on the same principle as that of the wheels; the same test may be used as for the rear wheel. The two bearings in the steering-head may be adjusted by screwing the cone of the top one, and, of course, the wheel may be made hard steering or easy, to suit the taste of the rider. This is not a matter of material importance. The adjustment of the pedal bearings is not of so great importance, but it should be seen to that they run evenly and quietly, as it is at this point that the propelling force is applied. This is usually accomplished by tightening or loosening the outside cone, which may be gotten at by removing the dust-cap. Perhaps it would be as well to speak here about the frequent mishap of a broken ball in the bearings. As soon as one is found broken, waste no time in removing it; one ball less will do no harm; but if the wheel is ridden with a broken one, it will soon cut the cone and rim all to pieces. A word about oiling. Do not go to the excess of either too little or too much oil. In the first case the cones and rim will wear more quickly and the bearings run hard; and in the latter the oil will gum, causing hard running, or, if it does not do this, it will ooze out of the joint, and, collecting the dust, will become gritty and mar it. The amount and frequency of the oiling, of course, depend on the use of the bicycle. For a wheel moderately used, a fair oiling once a week will be found amply sufficient. Most of the bearings have openings in which to apply the oil, and the oil should not be applied at any other place than these. 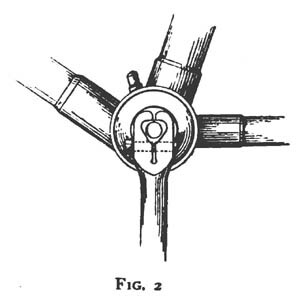 In the case of the head bearings, unscrewing the cone of the upper one will expose it, and will permit the head to be raised so as to expose the one on the crown for oiling. The pedals may be lubricated by removing the dust-cap and applying the oil on the outside bearing, tilting the machine so that it will run down to the inside one. To have the bearings in first-rate condition, they should be cleaned every month or six weeks. In cleaning them the cone should be taken out, carefully wiped, the balls put in kerosene oil to remove all possible grit, and the rim wiped clean of all remains of previous oilings. The easiest ones to get at are those of the front wheel and pedals. In the former case, all that is necessary is to undo the nuts and spring the wheel out of the fork, unscrewing the movable cone and taking out the axle. In the pedals, remove the dust-caps and the outside cone, and slip the pedal off. The rear wheel is a little more troublesome, the chain having to be removed from the rear sprocket before the wheel can be taken out. To remove the chain, unscrew the small screw-bolt that holds two of the links together. The bearings in the head will also be a little troublesome, as it is necessary to remove the handle-bars and top cone and take out the front fork. The only remaining bearings to be spoken of—those of the crank-axle—are in some respects the most important to have clean, and at the same time the most difficult to get at, as it is necessary to take off the cranks before the axle can be removed or the bearings exposed. After the cranks are removed, the rest is usually an easy matter. To give any general rule for the cranks’ removal is impossible, as there are so many methods in use for attaching them to the axle; but to know the way to remove the several prominent patterns may be useful. We will select four of the general methods, and these will suffice to cover most of the ground. These may be best understood from a study of the accompanying sketches. 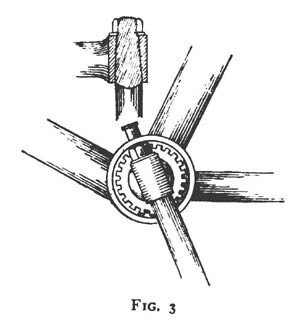 First, the most common way of putting the cranks on with a key or pin is shown in Fig. 1. To remove these, unscrew the nut on the pin and drive it out. This may be done at home, but as a rule the pins are put in, or become wedged in, so tightly that it is frequently advisable to have them driven out at a shop. In the absence of proper punches, there is the chance of badly mutilating the pin in removal. The second general class is the clamp attachment. There are several patterns in use, but the one shown in Fig. 2 is most commonly seen. To free it from the axle the bolt is removed, and it is frequently necessary to insert a wedge to spring the clamps free from it. 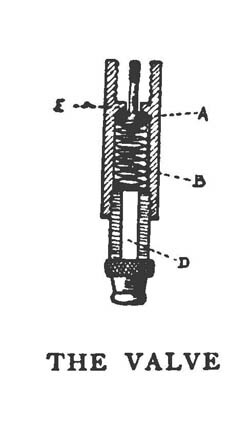 In the third class the crank fits in a continuation of the axle, usually projecting a little, so as to permit locking with a nut, as in Fig. 3. Sometimes it passes a little to one side of the centre, and, again, exactly through it. The fourth and general class is where the axle and cranks are made in two forgings, as shown in Fig. 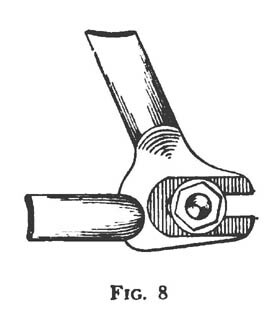 4 (the sketch represents a cross-section of the barrel), the part shown being half, and the two sections fitting together by teeth. These cranks are removed by unscrewing in the opposite direction to which they revolve in the propulsion of the machine. The next part of the wheel we will turn our attention to is the chain—the medium through which the motion is imparted from the driving-gear to the rear sprocket. Frequently after a long ride on rough roads, or perhaps a few days of usage, the chain will be found to have slackened up considerably. There are many devices in use for taking up this slack—all of them, however, working on the principle of moving the rear axle back and forth, and being more or less improvements of a few general patterns. In the device represented by Fig. 5, after loosening the nut, the axle is moved backward or forward by turning the screw in the proper direction. If it is desired to move the axle back (Fig. 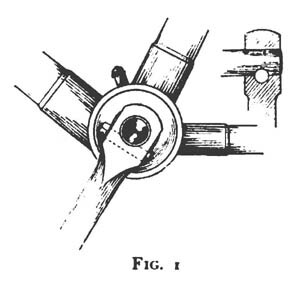 6) the screw is tightened, or if it is desirable to move it forward (nearer the cranks), the screw is unscrewed, and the axle pushed forward by gentle taps with a wrench. In the method represented by Fig. 7 the whole bar swings with the axle. 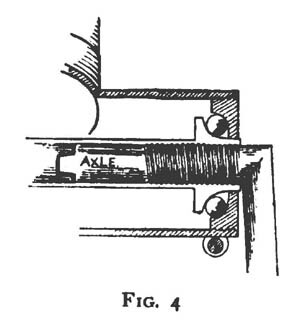 This adjustment is tightened or loosened in the same manner as the preceding one, with the exception that the nut on the bolt holding the upper end of the bars has to be loosened a trifle. In the arrangement shown in Fig. 8 the axle is adjusted without the aid of a screw. When in the right place, it is held by the tightening of the nuts, teeth in the washer engaging others around the edge of the slot. No part of the machine collects the dirt more quickly than the chain, it being found liberally sprinkled with grit after every ride. As long as it runs smoothly and quietly it does no harm, though when it gets rather thick it would be best to wipe it lightly with a rag or a stiff brush. When a chain is dry or very dirty it shows a tendency to kink, at the same time producing a rattling noise, joined with sharp snappings. When in this condition, it should have a thorough cleaning. First wipe with a rag, and then remove the chain from the sprockets; put it in kerosene oil to soak, wiping dry with a rag. The only troublesome part of the cleaning operation will be to replace the chain. This is effected by passing one of the ends of it over the rear sprocket, joining them with the screw-bolt; then, catching some of the links on the top teeth of the front sprocket, revolve it, and this will spring the chain on. The mention of a “dry” chain brings up the subject of chain lubricants. There are a great many on the market, and riders differ in opinion as to their relative merit. Two facts are clear, however. If a lubricant is too liquid it collects grit very quickly; on the other hand, if too dry, it does not work in the joints of the chain properly. Oil, for this reason, is obviously very bad, and should only be used on the road when a chain unexpectedly runs dry or hard. The prominent constituent of most lubricants is graphite, the different makes varying usually in the amount of oil or other dissolving agent contained. Some wheelmen recommend powdered graphite alone, but my experience has found a mixture of graphite and oil having about the constituency of vaseline to be very satisfactory. All lubricants, however, should be applied in the same manner. Rest the step of the bicycle on a box or chair, so that the rear wheel may revolve freely, and apply the lubricant rather sparingly; too much will only serve to collect dirt. Spin the wheel rapidly for a minute, so as to permit it to work into the joints, and then, slowly revolving, wipe the waste off the top of the chain. We have now reached in our discussion of the bicycle a part just as essential to the running ability as anything previously mentioned—the tires. On account of the wear and tear upon the tires, from one cause or another, they require much care. It is the tires that take up the jolts from the inequalities of the road, and upon their proper degree of inflation depends the easy running of the wheel. Quite a study may be made of this, the pressure varying for the different uses the wheel is to be put to. Without exception the rear tire should be harder than the front; if the latter is more tightly inflated than need be, it creates unnecessary jarring, which manifests itself in a numbing of the wrists. For riding over city pavements the softer the tires, without endangering the rims, the less jolting; but on good roads hard tires are best, as there is less friction, because a smaller surface is presented to the ground. From the inflation we will turn to the valve, the most important part of the tire. This is frequently a source of much annoyance from leakage. Whenever in doubt as to the valve’s effectiveness, immerse it in water, and the air-bubbles will soon show the size and location of a leak, if there is one. In all experiences with pneumatic tires you will find water the greatest enemy of leaks, and in all cases where one is of sufficient size to be an annoyance, water will surely locate it. 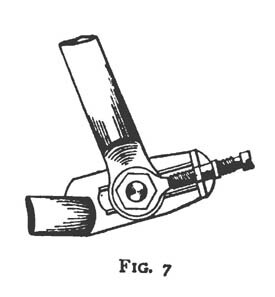 The weak point in most valves seems to lie in the plunger that closes the opening through which the air is admitted. Most valves work on the principle explained in the sketch. 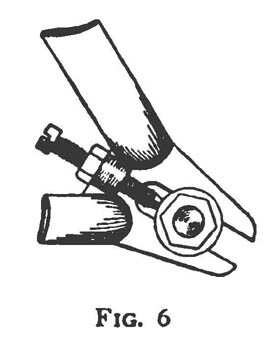 When the air is forced in, the plunger A is pushed down, admitting the air into D, and so into the tire; and when the downward stroke of the pump ceases, the spring B, assisted by the pressure of the air in the tire, is supposed to push A tightly up against the partition E, and so close the opening. Right here the trouble occurs. For various reasons the spring sometimes does not push the plunger up, and if the pressure is not sufficient to do it, when the pump is removed the air forced in with so much labor blows out in a few seconds. In this case, first drop a little benzine in, as perhaps the valve may be dirty or stuck in some manner; and if this has not the desired effect, it will be necessary to remove the valve. This annoyance is most commonly caused by the spring becoming too much compressed, but this may be remedied by removing the spring and stretching it a little. 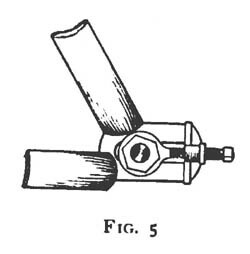 Frequently the plunger becomes jammed against E, and in pushing it in it disappears entirely within the body of the valve. Here also it is often necessary to take the valve apart. Puncture is a word that makes every wheelman wince. A little hole in the tire makes the bicycle, which a few seconds before was a means of travelling, a useless encumbrance. But in this case it does not always follow that it is an encumbrance, for if a pocket repair kit is carried, or the rider can make the best use of things at his disposal, some kind of stoppage of the escape of wind can frequently be effected. The single tube, or “hose-pipe,” is the easiest to patch up on the road. The leakage can usually be stopped by cementing a piece of rubber over the puncture and binding it on securely with tire tape. Perhaps if the rider is skilled he may effect a permanent repair by plugging it. Now a hint to the rider who goes on the road with only a wrench in his pocket; and if he is given to the chewing-gum habit, it may be of use. A very novel and effective repair for a single-tube tire may be made by a little chewing-gum and some bandages. After locating the opening, apply some freshly chewed gum and work it in, leaving a fair-sized piece on the tire, and bind it with a handkerchief, if nothing better offers. Sometimes it is difficult to locate a puncture when on the road. After examining the tire, and noting the likely places, apply saliva at these spots, and when the right one is found, bubbles will be noticed. The permanent repair of a double-tube tire is to patch the inner one. Let the air out, and if the tire is “cemented” pull it off, and if a “clincher,” spring it off, being careful in pushing the valve through the hole in the rim. If it is the “clincher” pattern the inner tube may be readily removed, but if a “cemented” tire it is a trifle more difficult. In the latter there is a slit about eight inches long in the outer tube, where the valve comes through, which is held together with lacing. Cut this lacing, and the two ends of the inner tube will be seen to come together there. Fasten a string to one end, and, catching hold of the other end, pull the tube out, being careful to leave the string in the casing. When removed inflate tightly, and, grasping firmly a section between your hands about a foot long, immerse in water and stretch to the utmost; and if the puncture is in this section, this will sufficiently enlarge it to permit the free escape of bubbles. Continue in this way throughout the whole tube, and when the puncture is located, bite a little piece of the rubber out from around it, so that it may be more readily found; let the air out, and cut a piece of rubber to fit over the hole, covering the edges of the puncture and this piece with a rubber cement made for this purpose; and when a trifle dry, place the patch on and put a weight on top. Inflate and test in water for leaks, and if all is right let the air out and fasten one end to the string, which was carried into the outer tube on the removal of the inner one, and by this haul it in place again, lacing up the slot with string. Inflate again, and, after covering the rim of the wheel with cement, place it on and let it dry, revolving the wheel with the rim and tire in water so as to make the cement set. The method of making permanent repairs in a hose-pipe or single-tube tire is simple—namely, by plugging. A rubber plug with a head like a rivet is covered with cement and inserted in the puncture, head inside the tire; and when it sets, the projecting part on the exterior is trimmed off evenly.